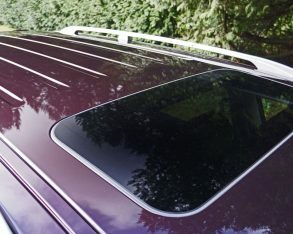 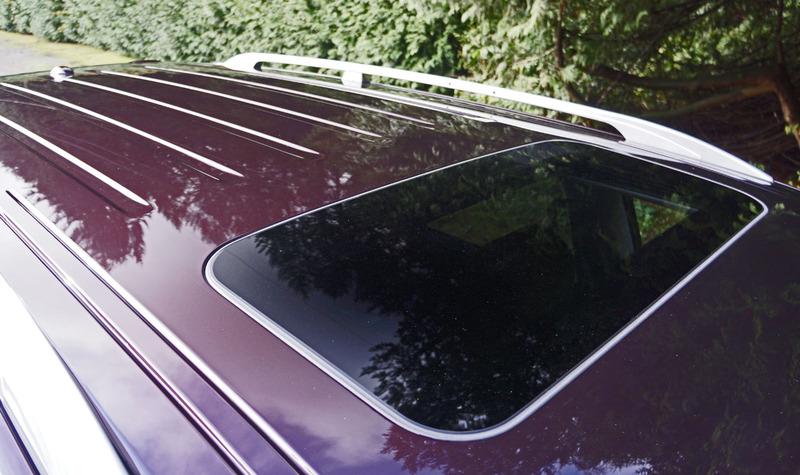 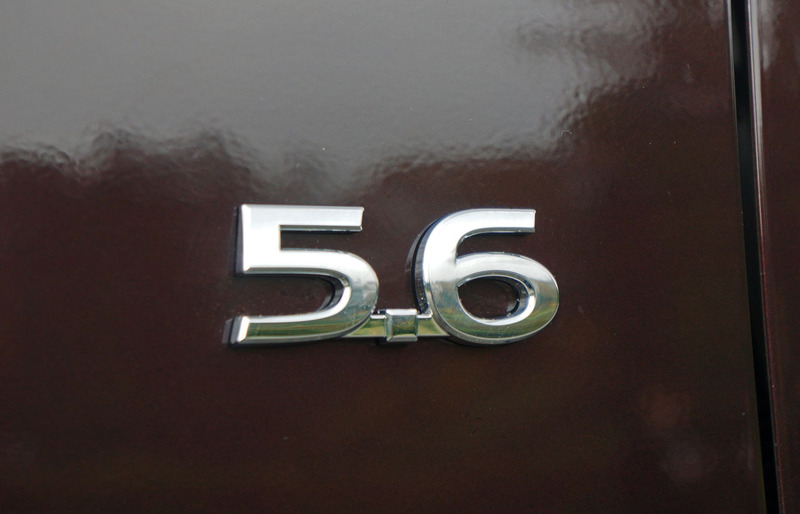 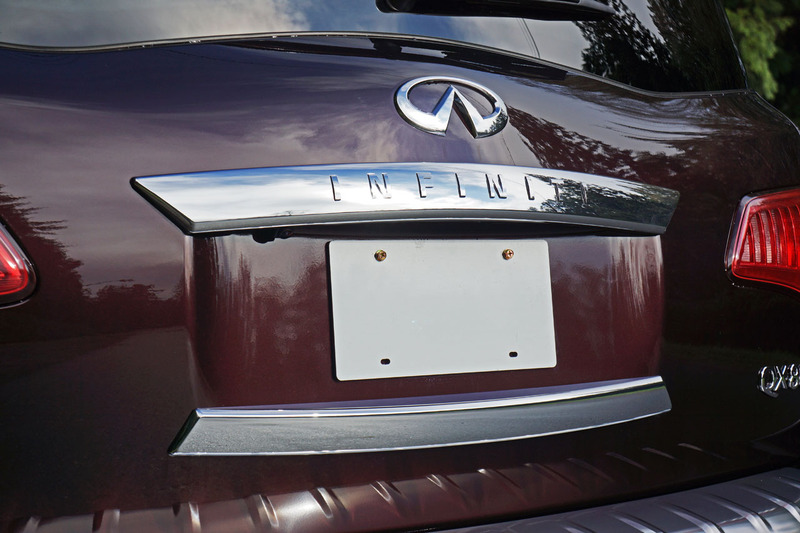 add a willingness to pay for a premium nameplate and a wider variety of top-tier off-roaders become available. 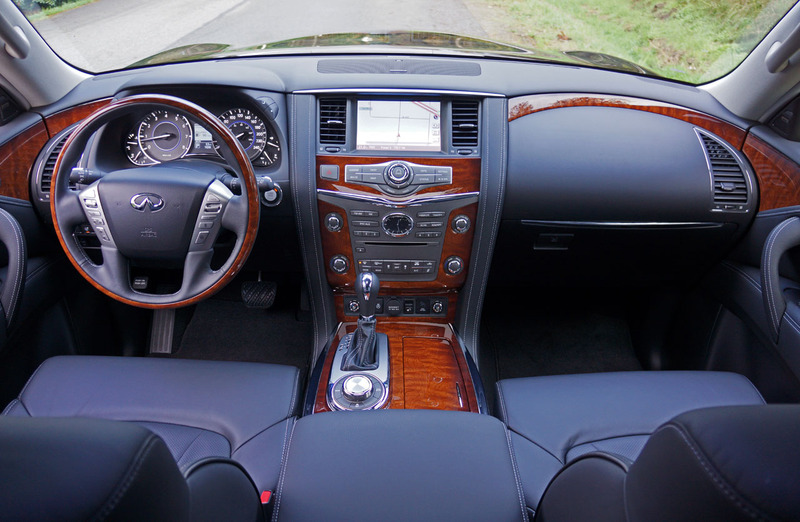 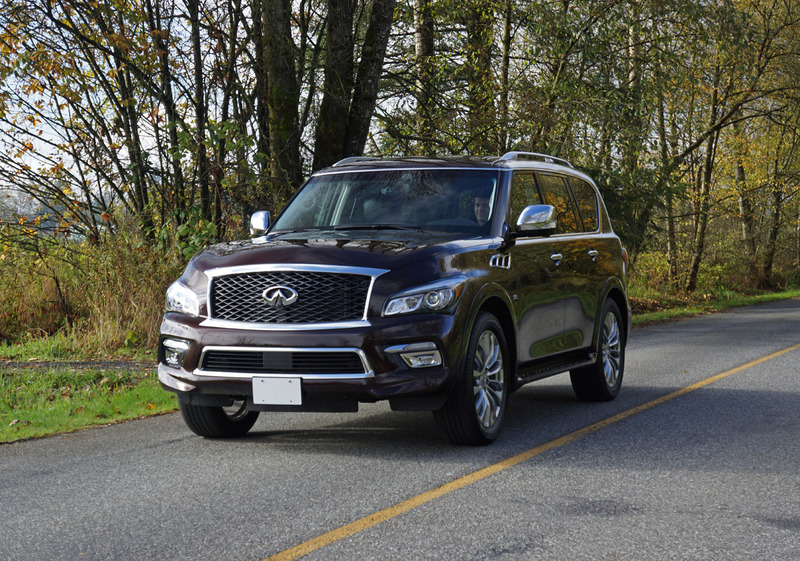 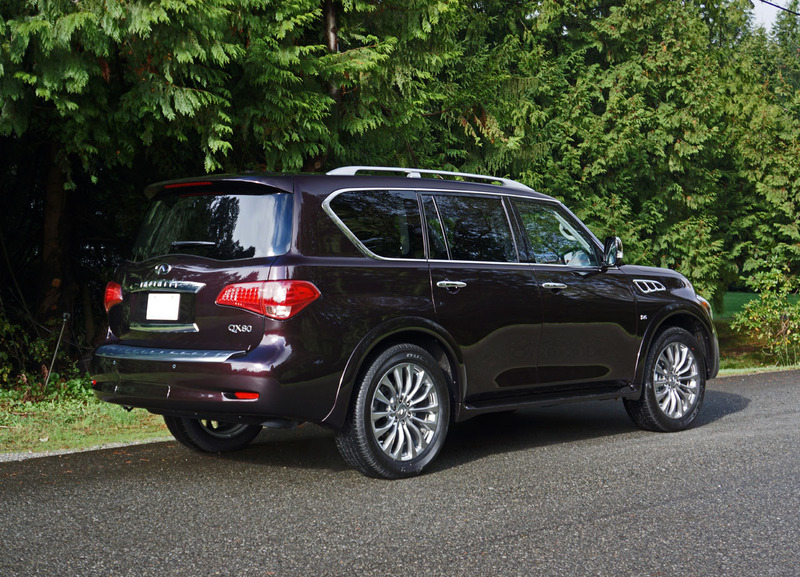 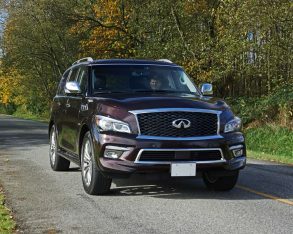 Amongst these the full-size Infiniti QX80 is not only one of the nicest, but also one of the segment’s best overall values. 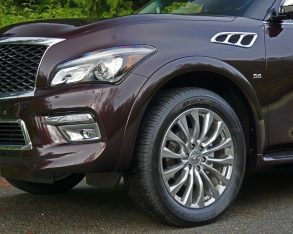 if you upgrade to the Technology package as per my fully equipped tester, the body-colour mirror caps get replaced with a set of chromed covers for an even more upscale appearance, while underpinning all the updates on my Technology-trimmed model was a gorgeous set of 22-inch multi-spoke alloy rims on 275/50R22 Bridgestone Dueler H/T tires, ultra-large on most anything else but looking ideally sized on this substantive Infiniti (20s are standard). 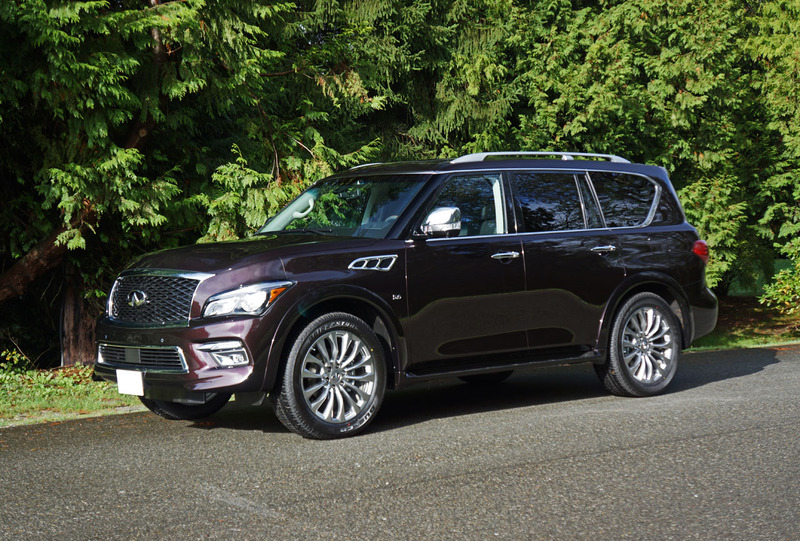 Yes, to say the QX80 has presence after seeing it in photos doesn’t even come close to the awe-inspiring effect it has in person. 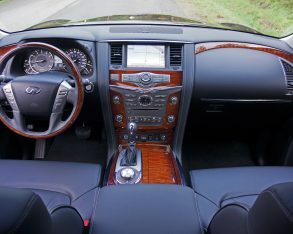 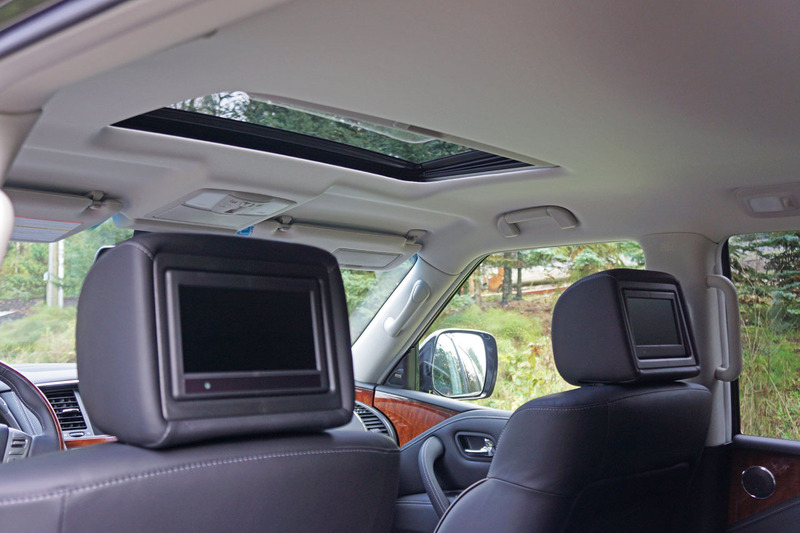 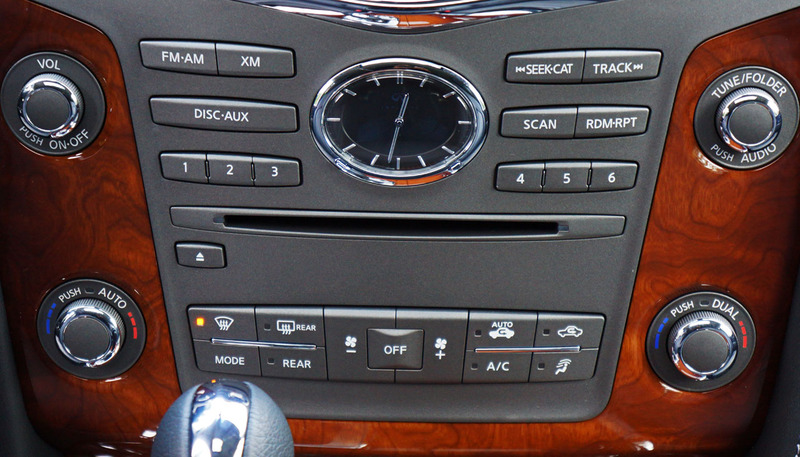 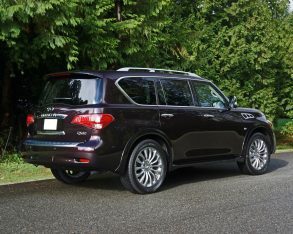 chest hair (shorter folks like me will be able to relate); the QX80 is big. 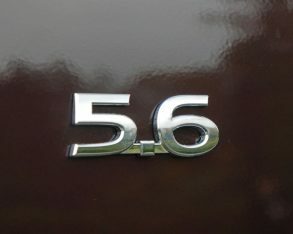 Unlike most of Lee’s characters, however, such as Saruman the White in the Lord of the Rings trilogy, Count Dooku in Star Wars: Episode II – Attack of the Clones, James Bond villain Francisco Scaramanga in The Man with the Golden Gun, or title monsters in horror films like The Curse of Frankenstein, The Mummy and Horror of Dracula, the XXXL-sized Infiniti is actually quite friendly. 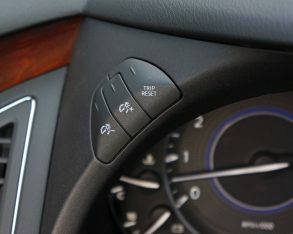 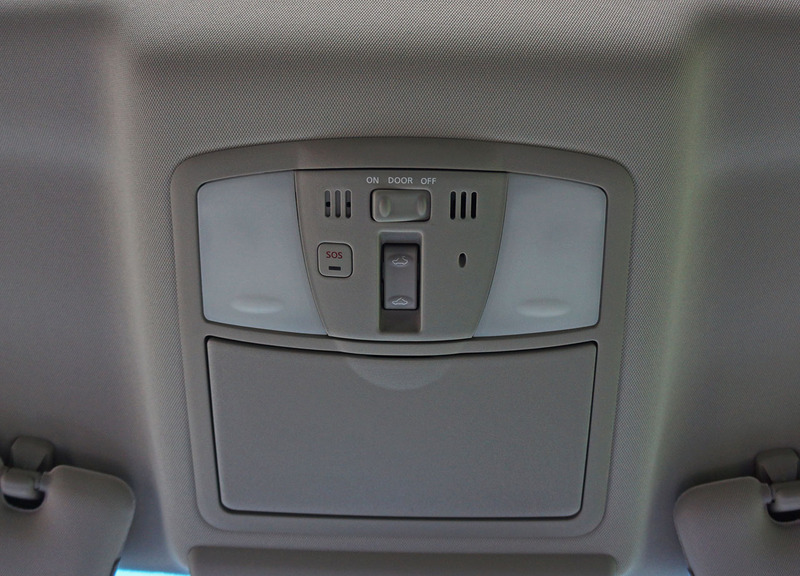 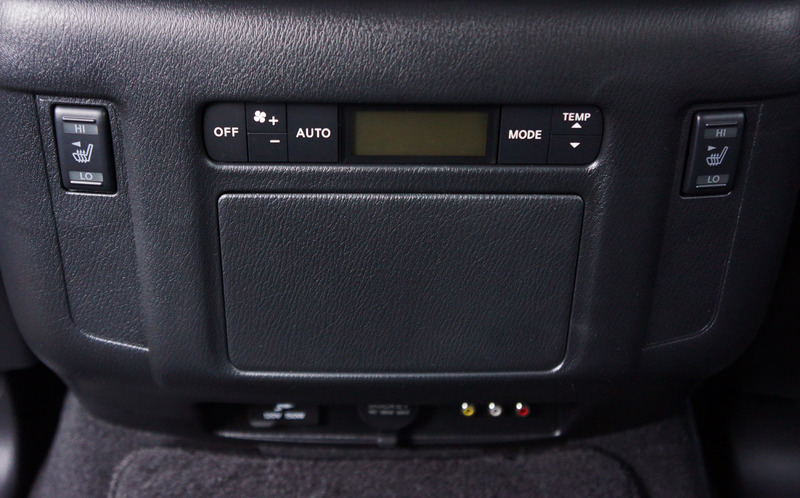 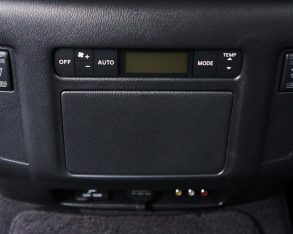 between individual driver and passenger automatic temperature dials. 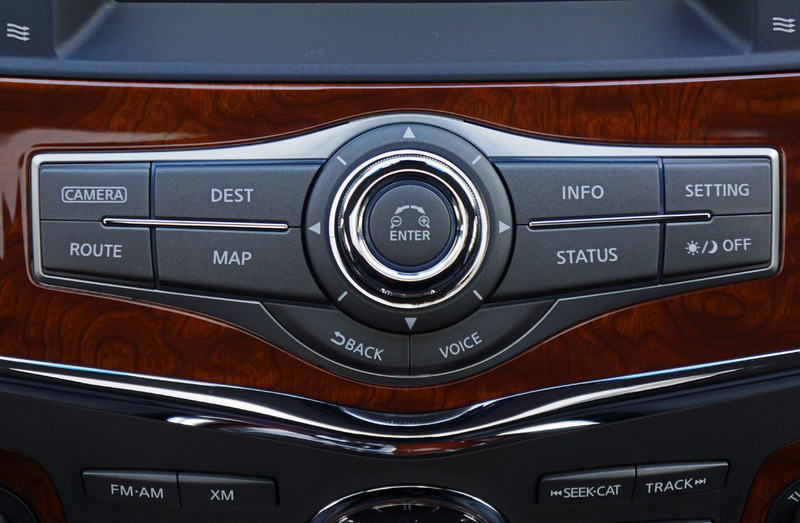 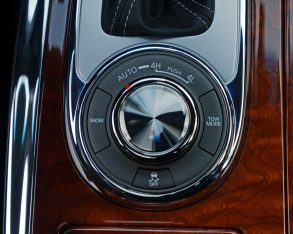 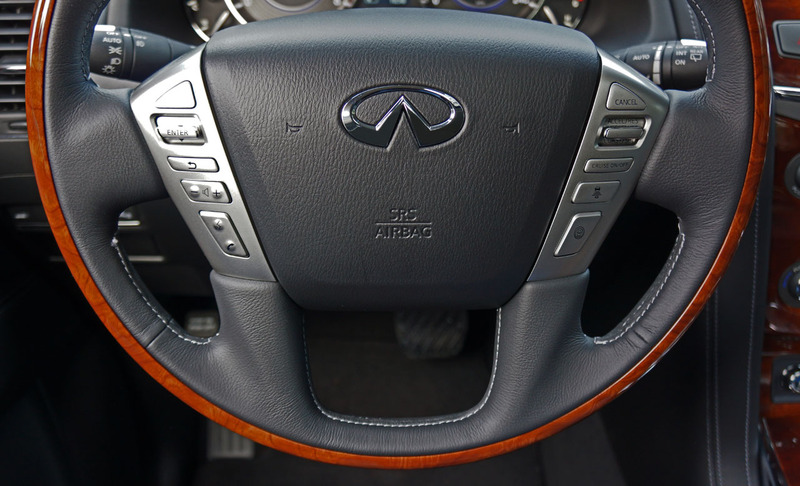 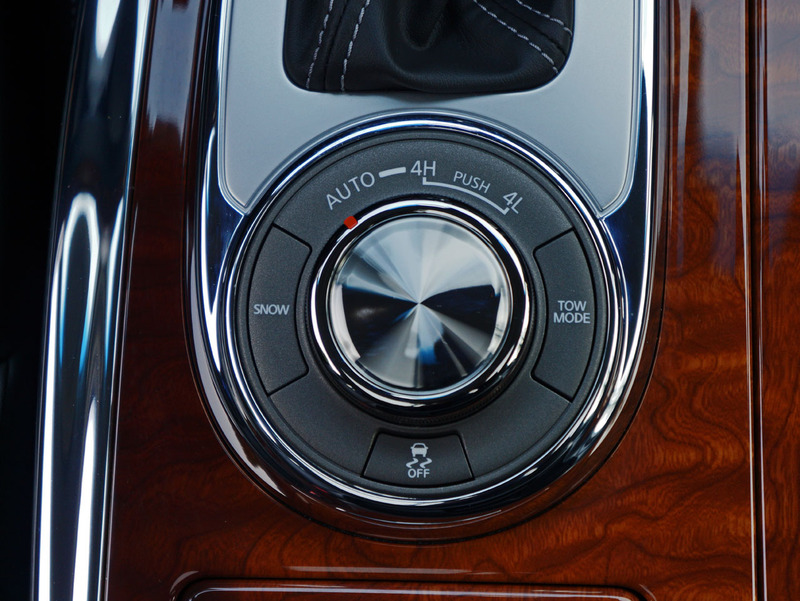 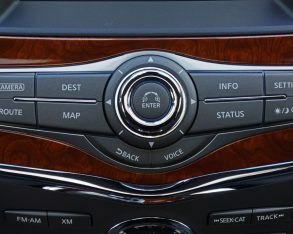 Above these are knobs for the audio system surrounding yet more buttons and a slot for CDs, all hovering around one of Infiniti’s most beloved trademarks, a gorgeous analog clock. 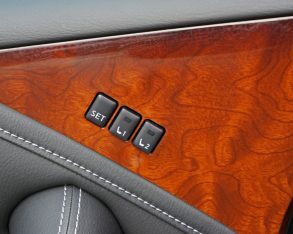 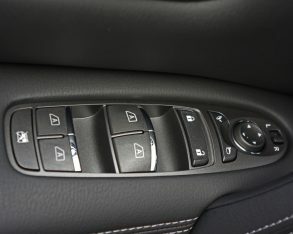 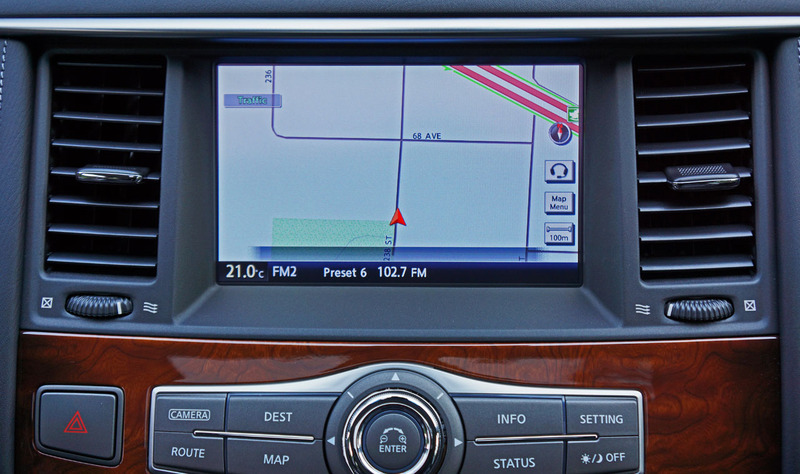 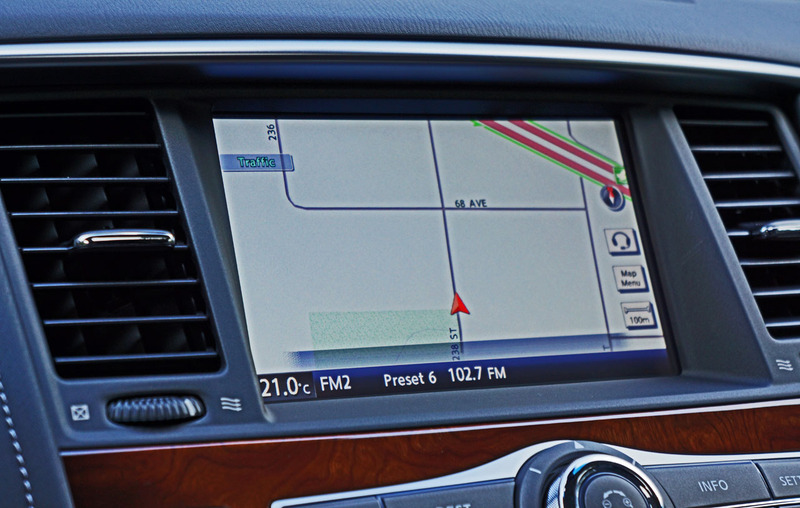 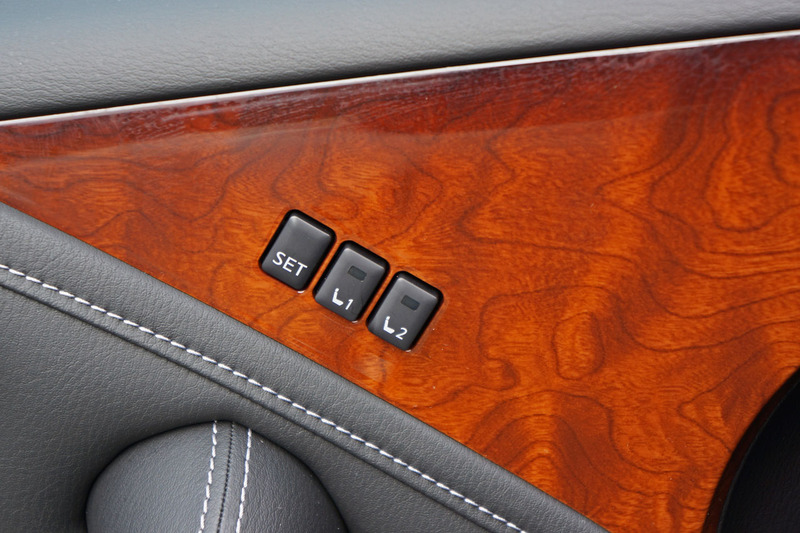 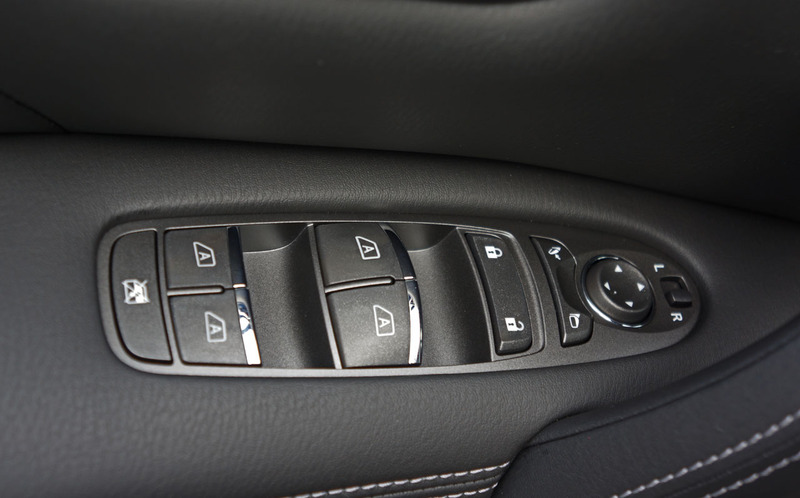 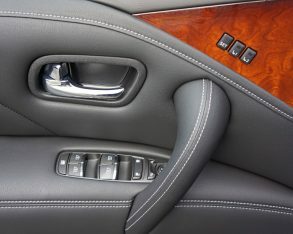 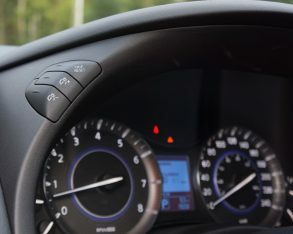 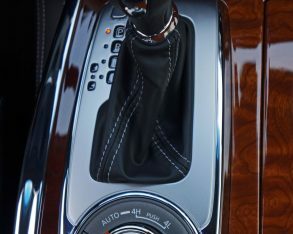 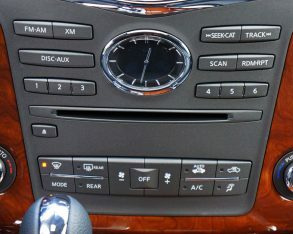 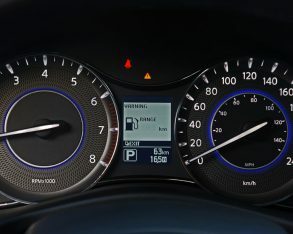 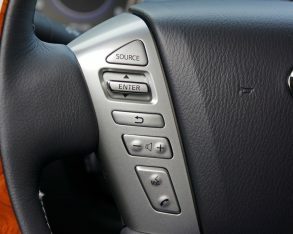 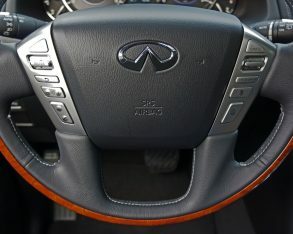 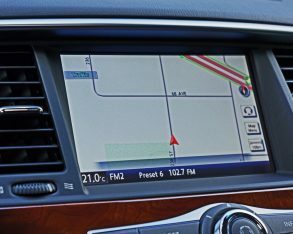 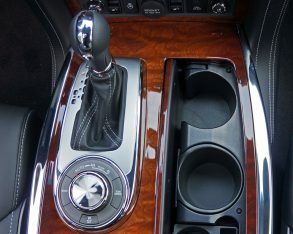 A row of infotainment controls sits below a slightly recessed eight-inch colour touch-screen display, finishing off the topmost portion of a centre console, which stretches down below to meet up with a leather, chrome metal and aluminum-finished gearshift lever as well as an elegant assortment of buttons surrounding a large rotating dial, controls for Infiniti’s All-Mode AWD system that connects through to a computer-controlled transfer case with settings for Auto, 4H and 4L. 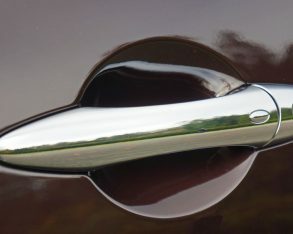 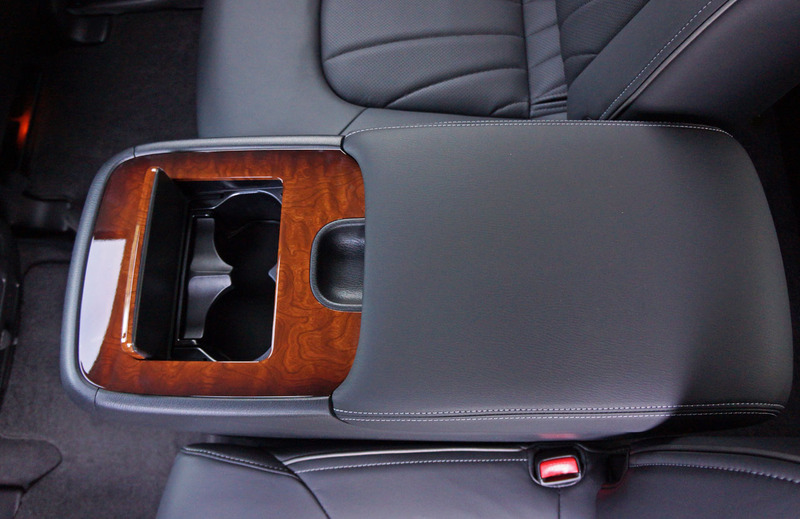 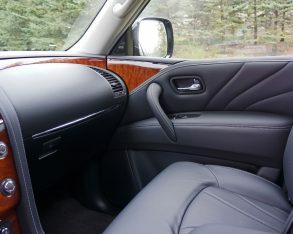 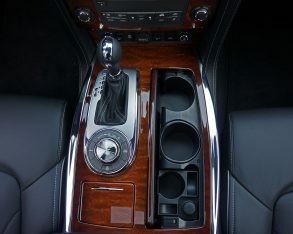 the centre console. 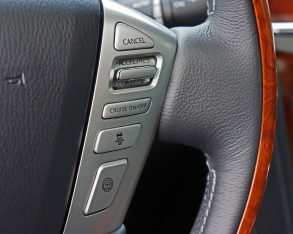 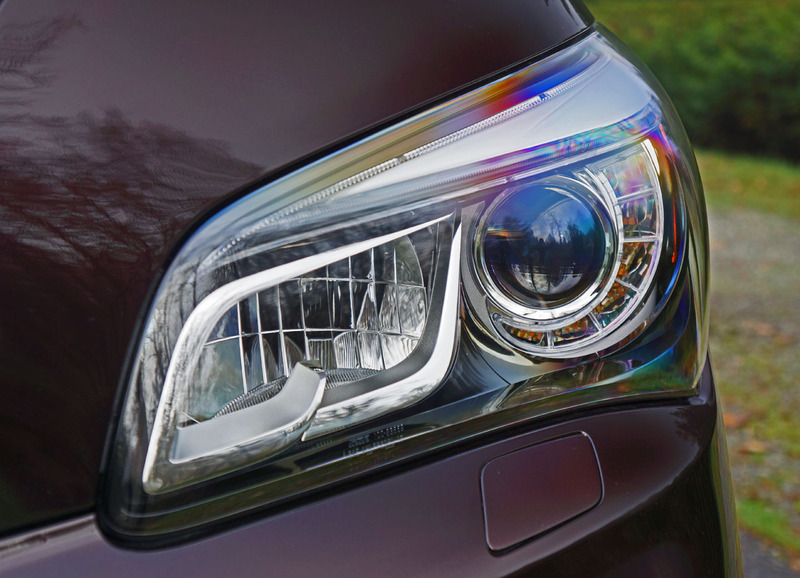 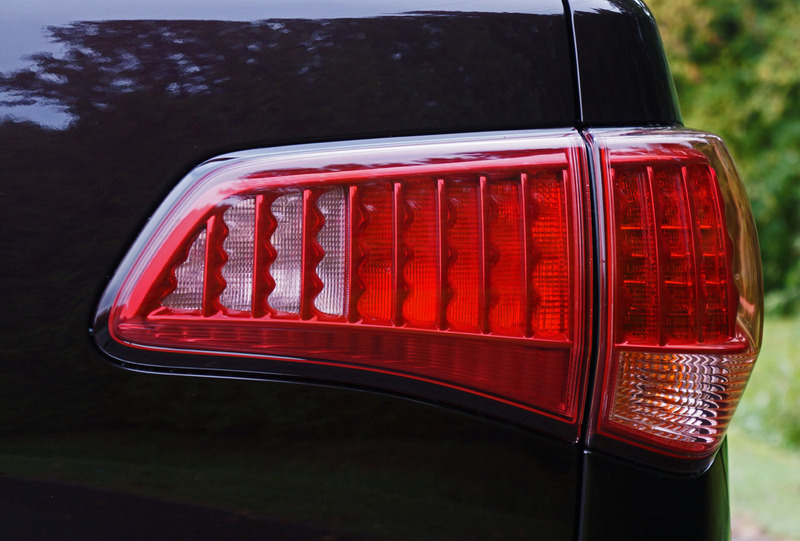 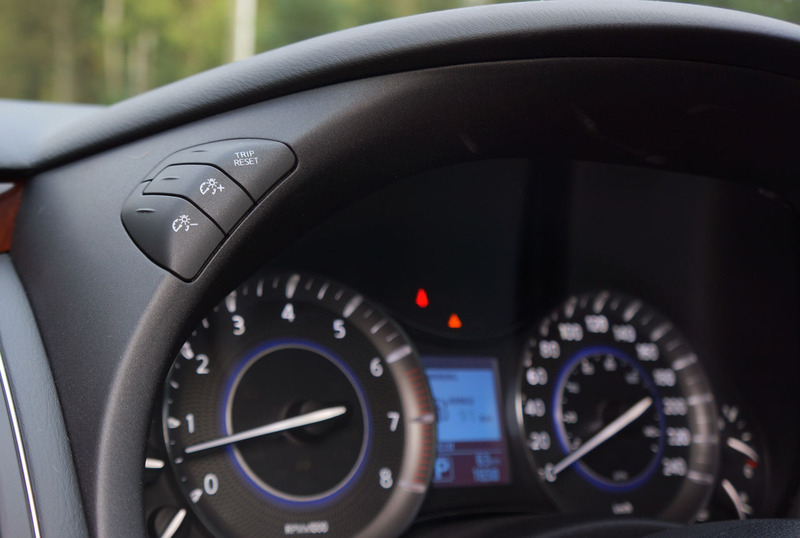 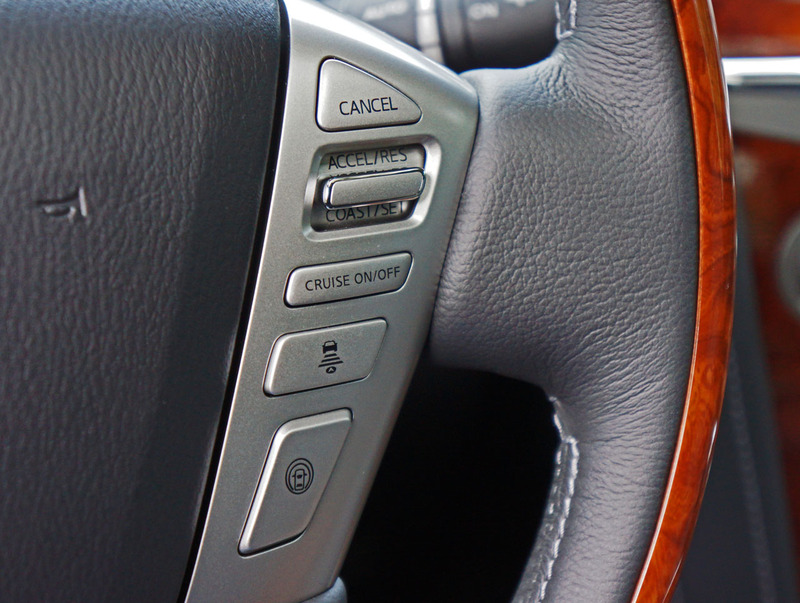 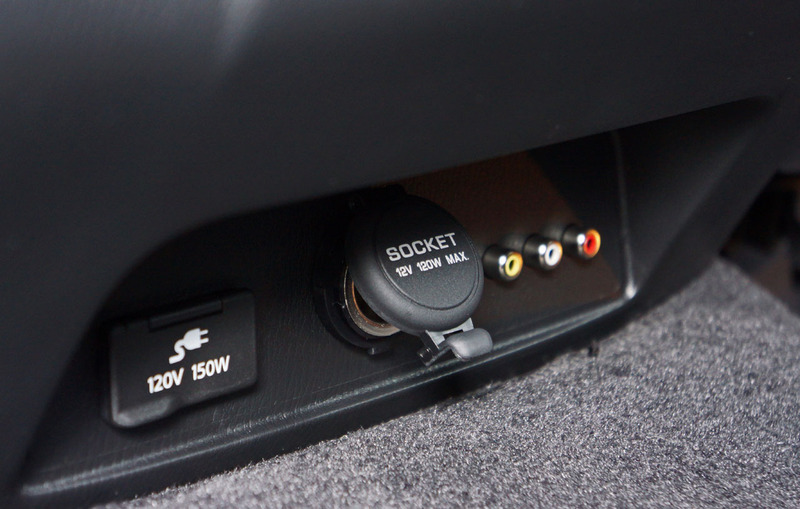 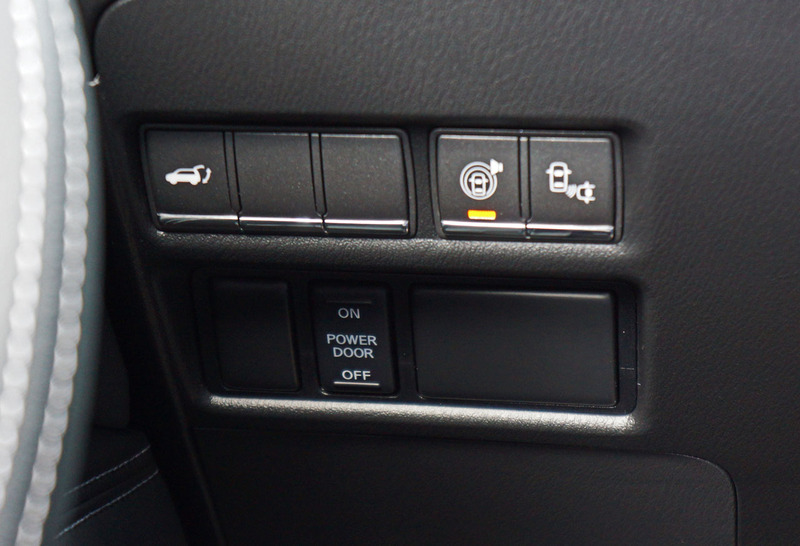 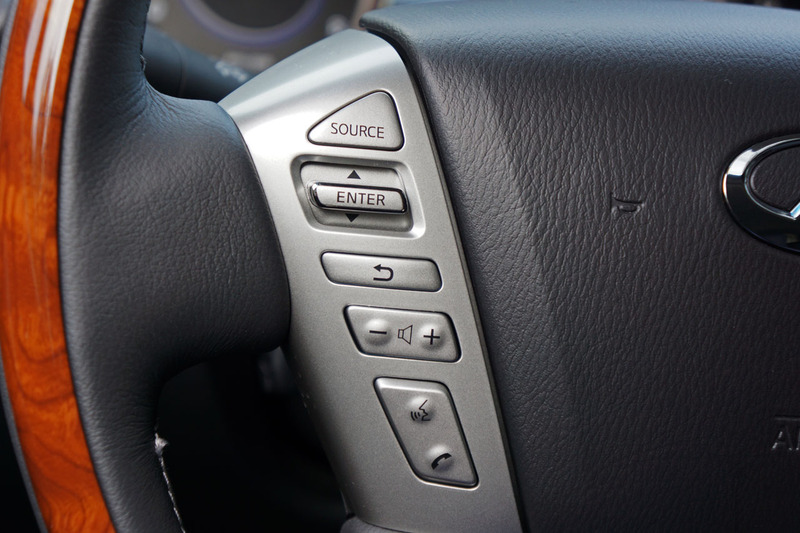 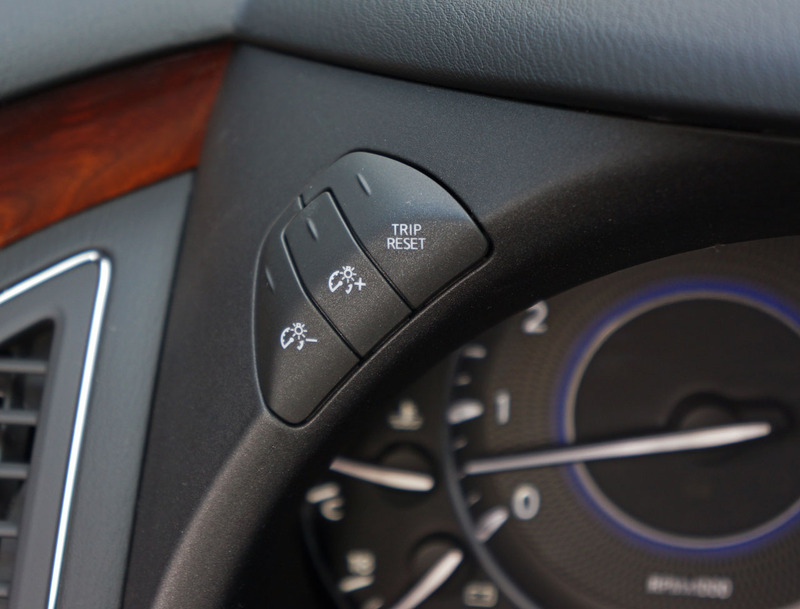 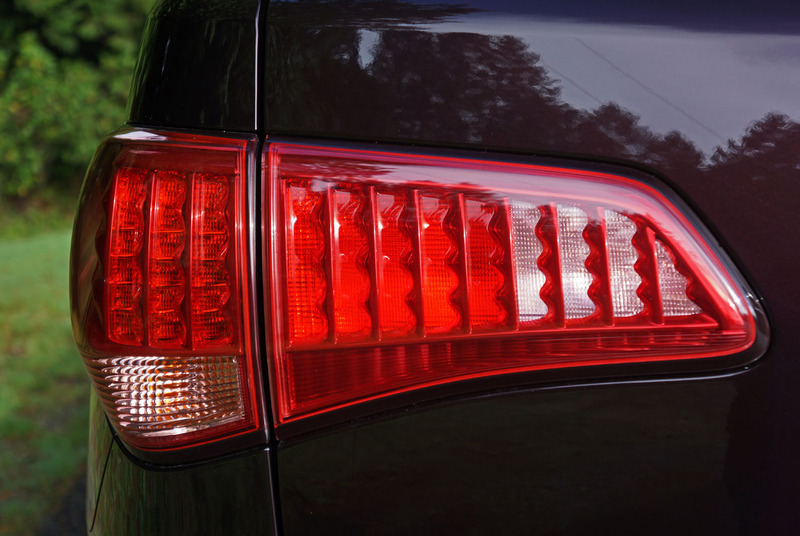 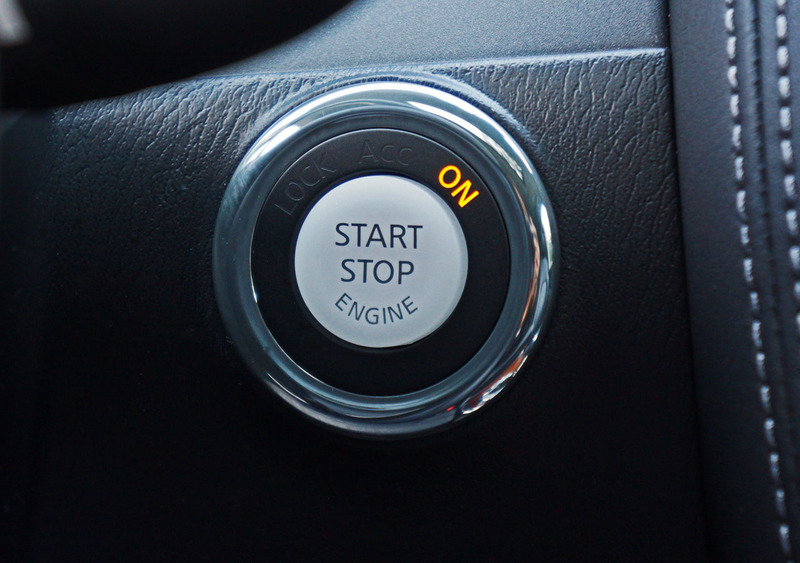 Redundant controls can be found on the steering wheel spokes, and they’re conveniently illuminated for use at night. 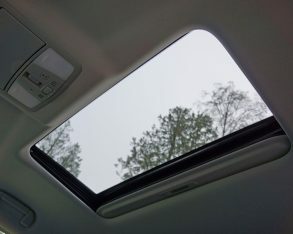 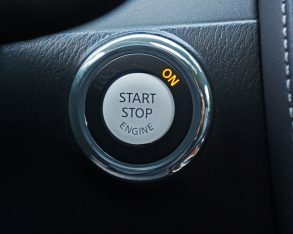 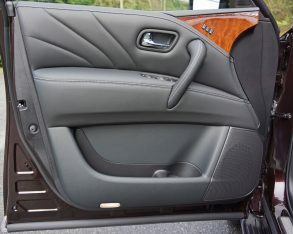 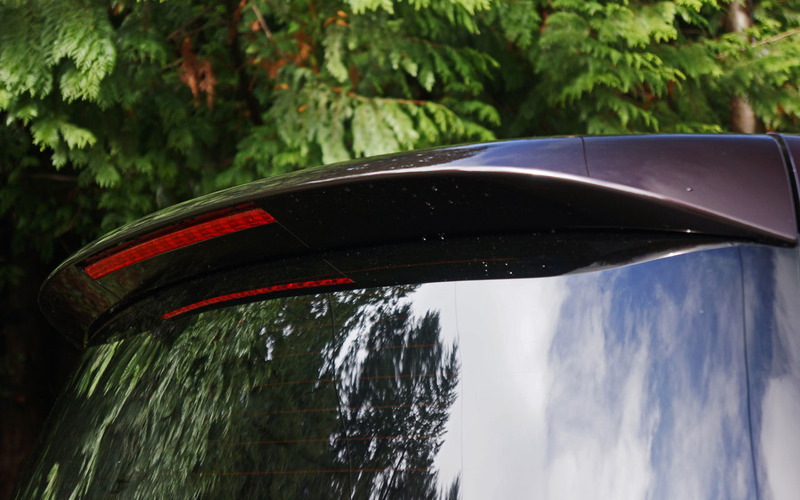 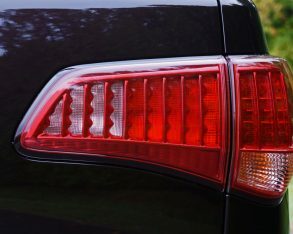 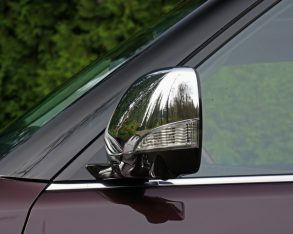 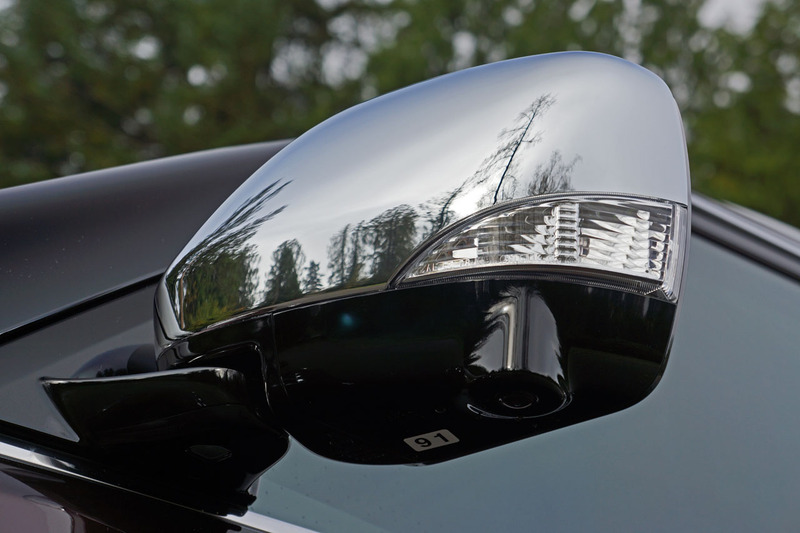 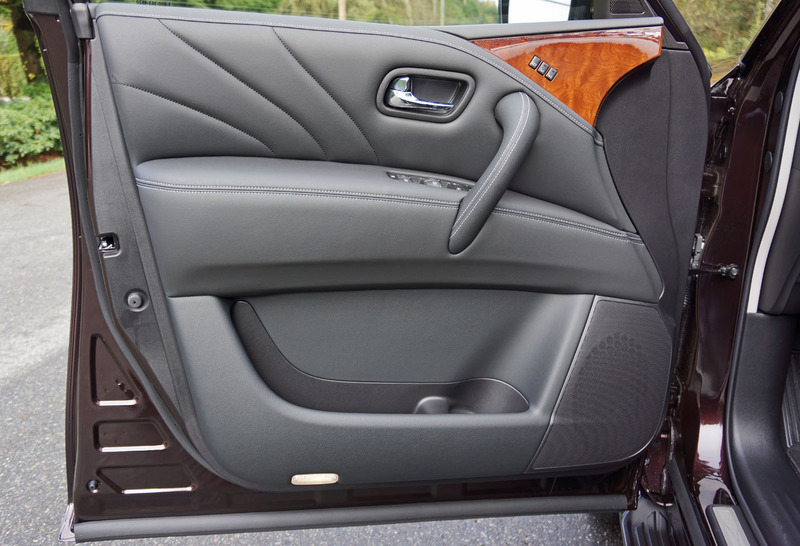 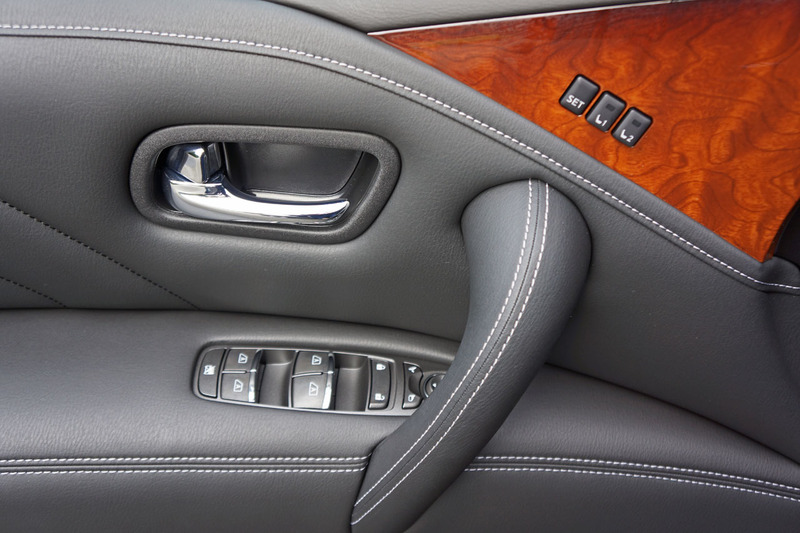 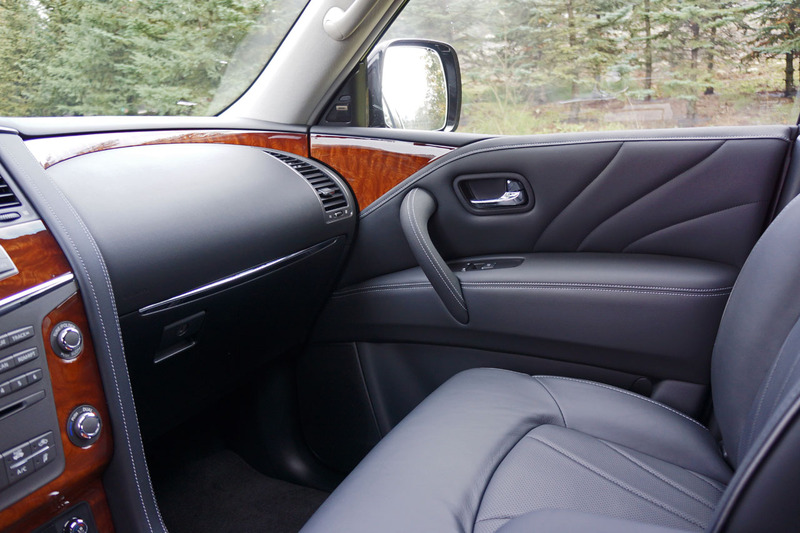 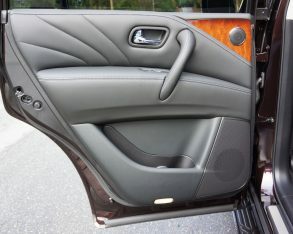 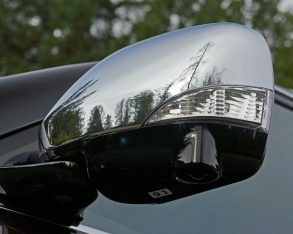 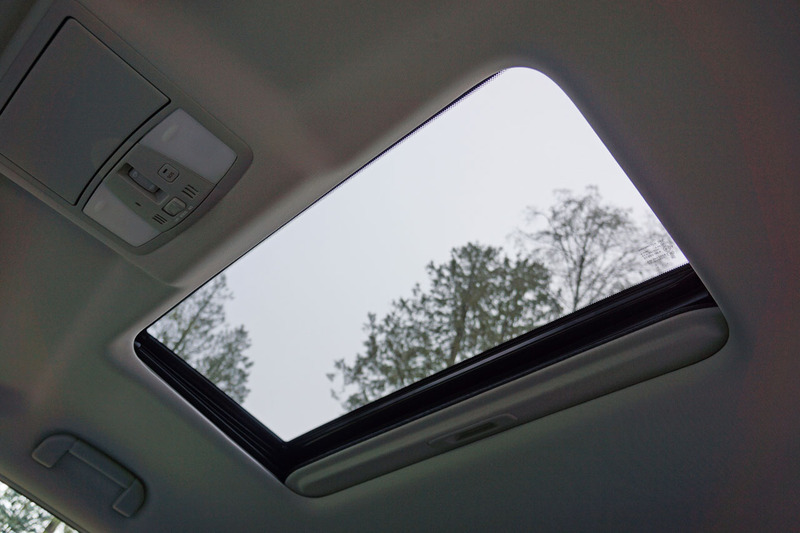 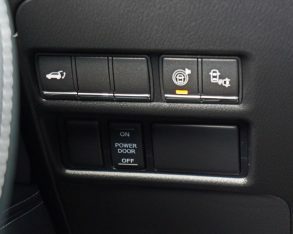 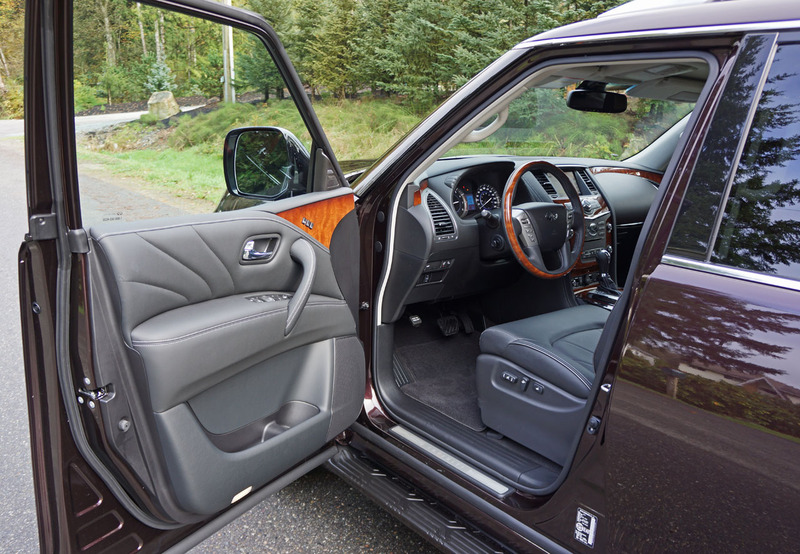 back to your chosen position at the touch of a button when reentering, along with the driver’s seat and exterior mirrors, the latter which are also auto-dimming, power folding, and heated, plus include integrated turn signals, courtesy lights and reverse tilt-down. 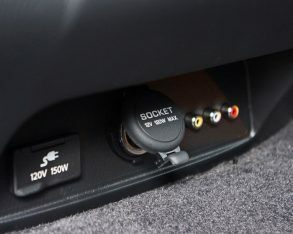 class four tow hitch and covered seven-pin wiring harness. 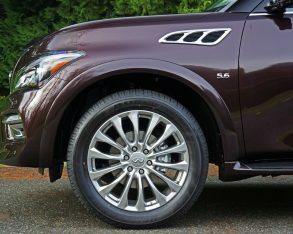 The last two features are standard because most buyers purchase the QX80 with intentions to tow a large trailer carrying a boat or camper. 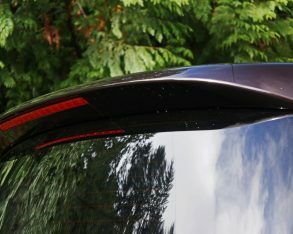 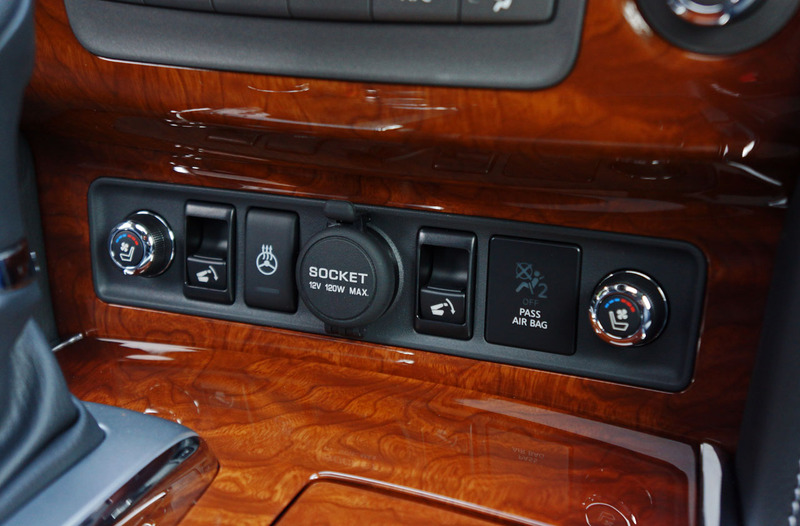 Of course, a tow mode feature is standard as is its substantive 3,855-kilo (8,500-lb) tow rating. 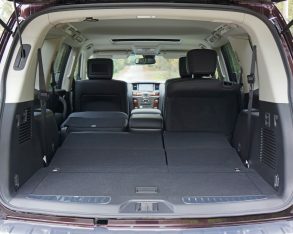 I never had opportunity to haul an Airstream Flying Cloud 28 up a steep grade or pull an Allante 825 out of the water via a heavily raked boat launch, but I’m quite certain it would manage such duties with ease. 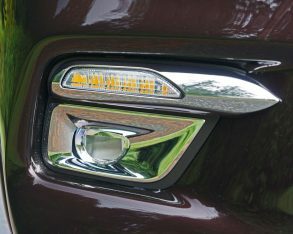 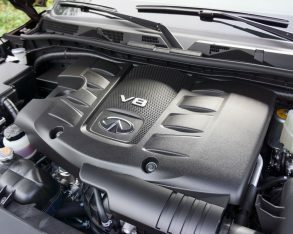 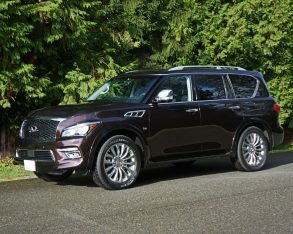 The QX80’s standard 5.6-litre V8’s 400 horsepower and 413 lb-ft of torque made no qualms about motivating the SUV’s 2,500-plus-kilo (5,633-lb) curb weight along with my partner and my added girth. 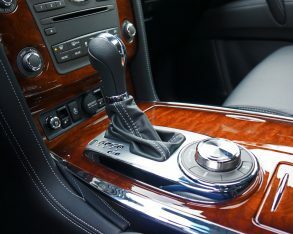 The big rig charges off the line with surprising energy, its seven-speed automatic wonderfully smooth if not as multi-cogged as some rivals. 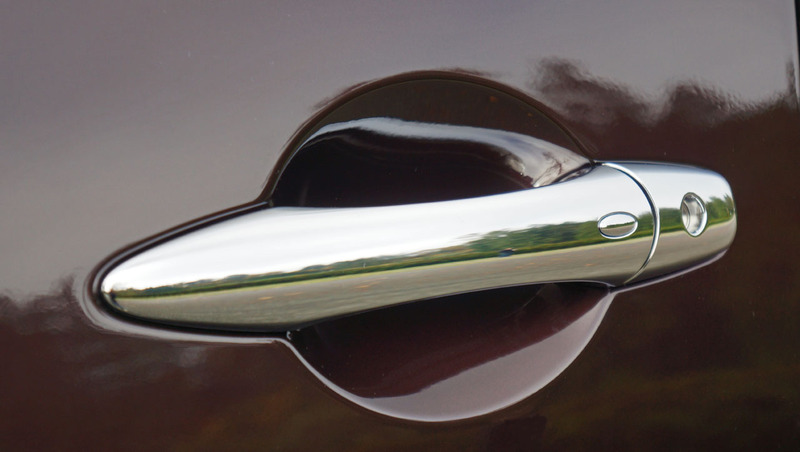 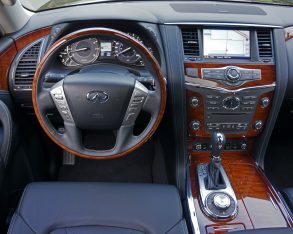 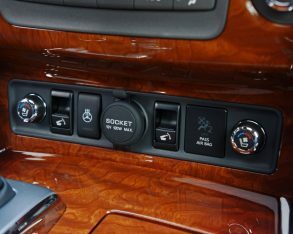 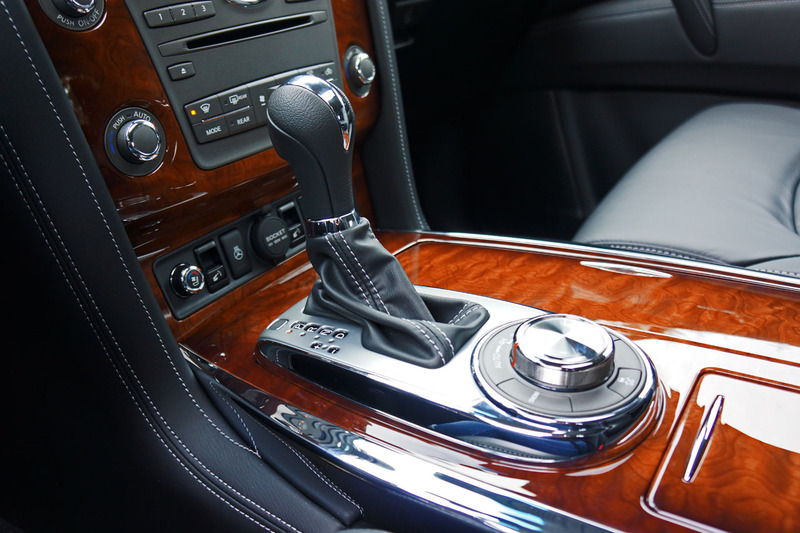 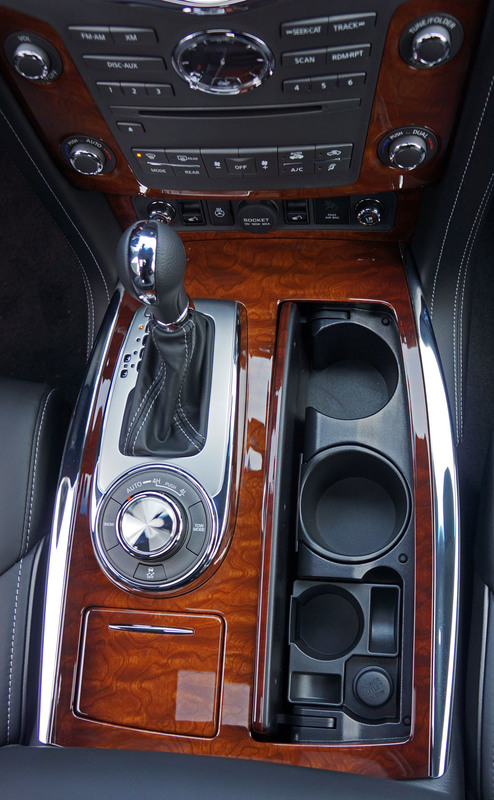 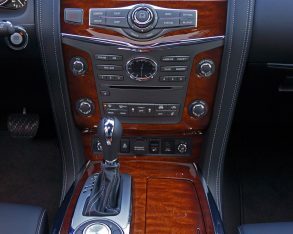 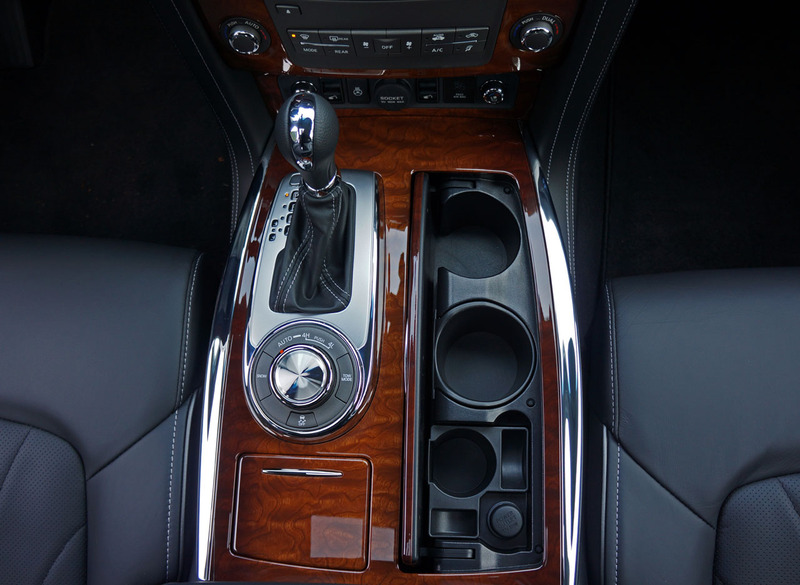 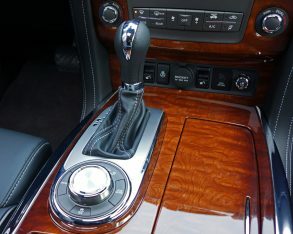 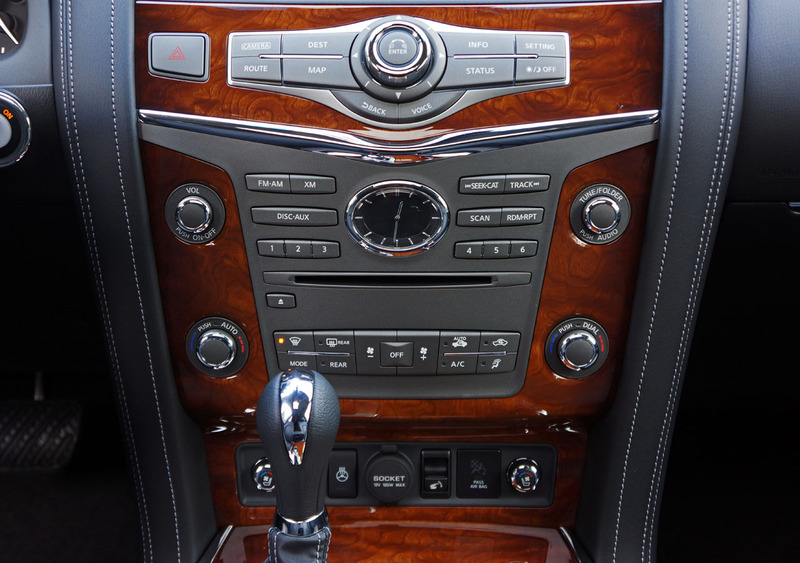 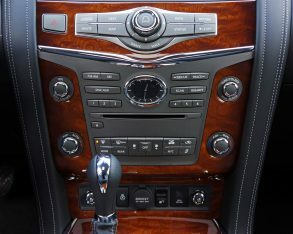 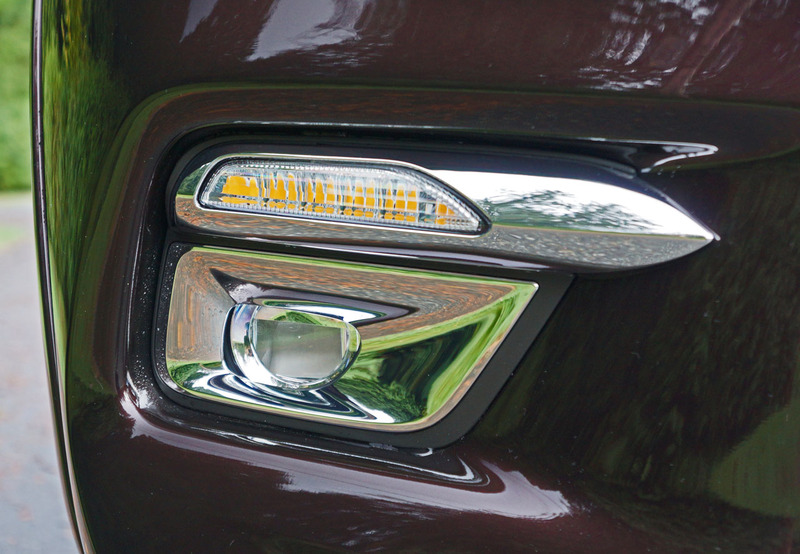 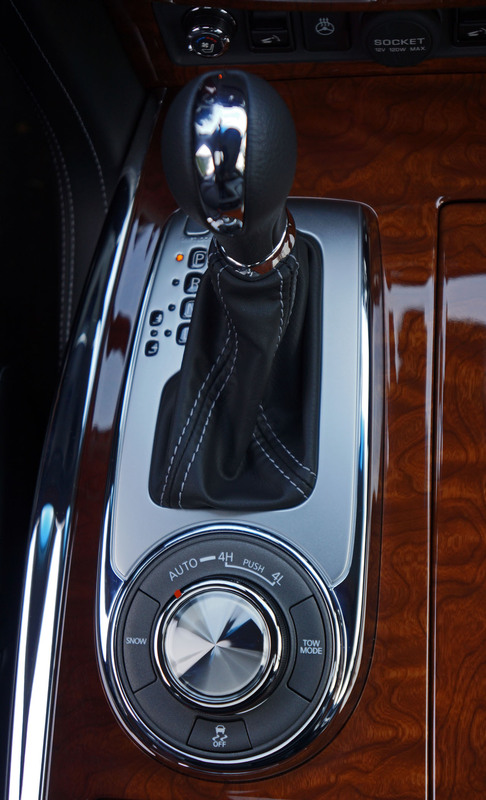 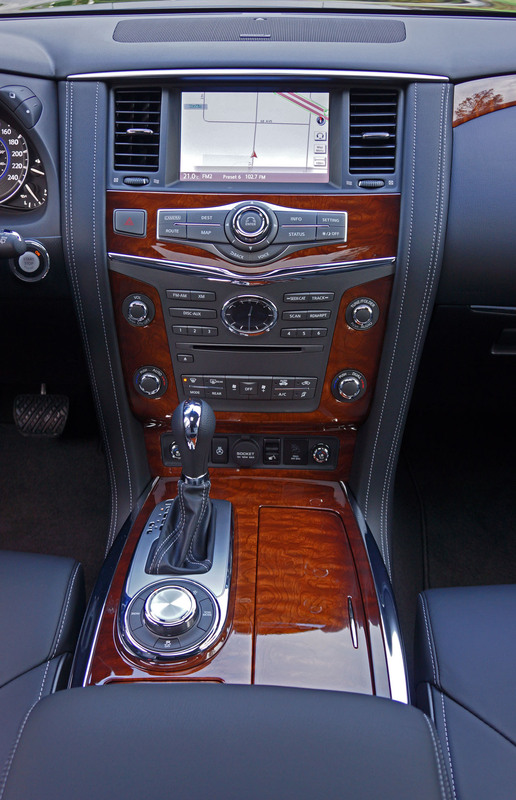 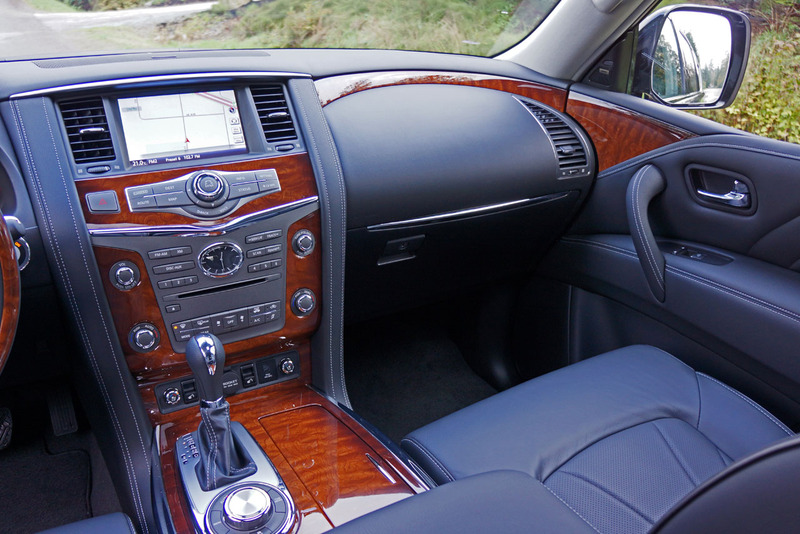 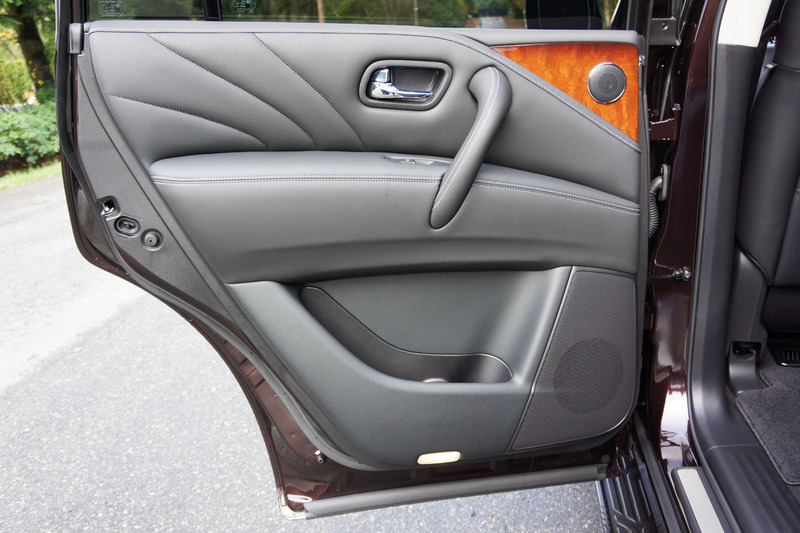 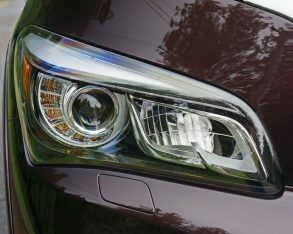 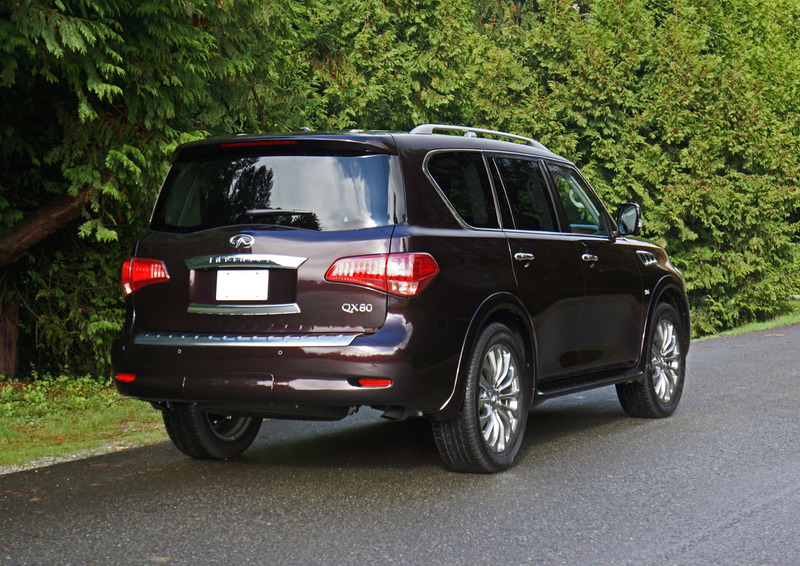 the gearbox the QX80’s ride is impressively smooth, one of the benefits of big, traditional body-on-frame SUVs. 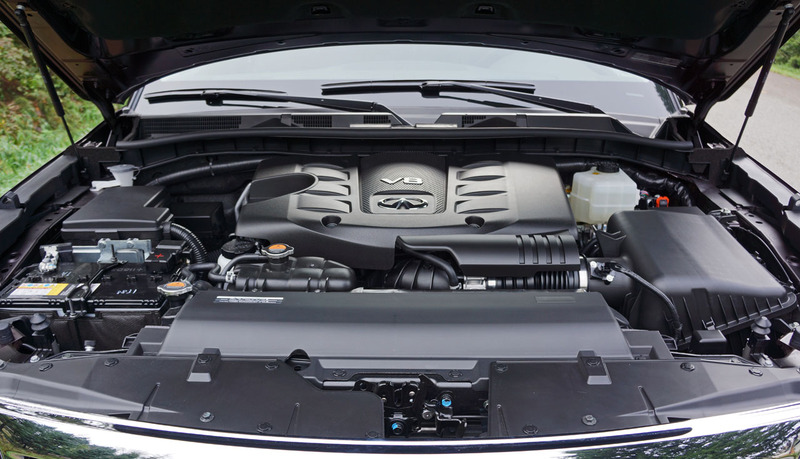 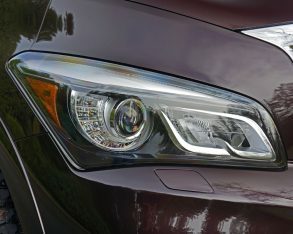 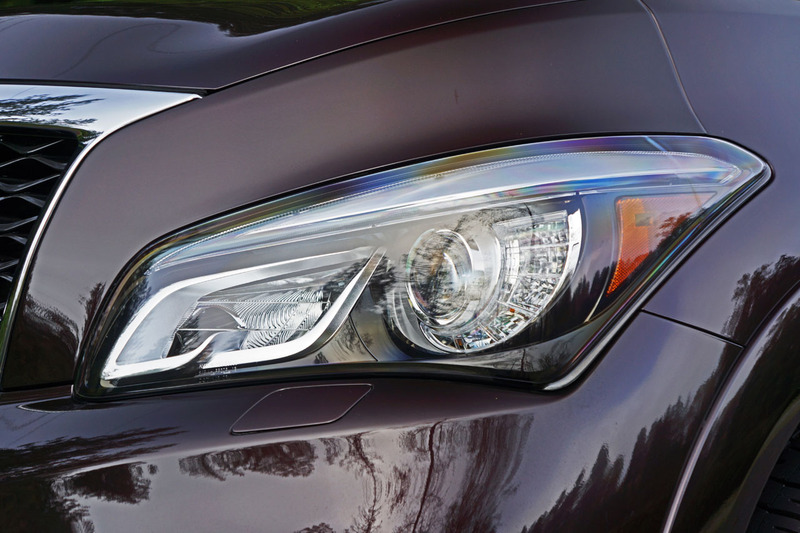 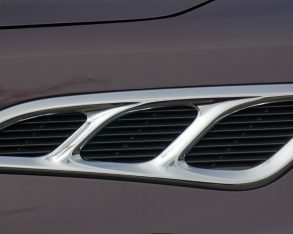 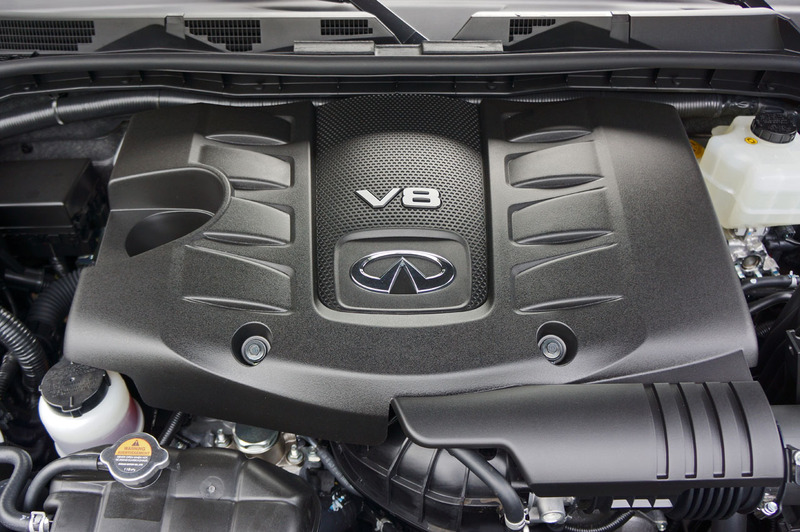 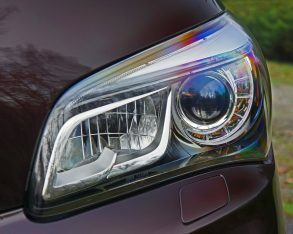 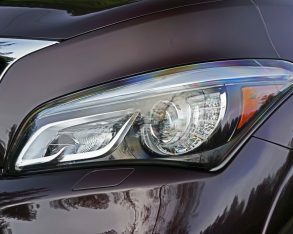 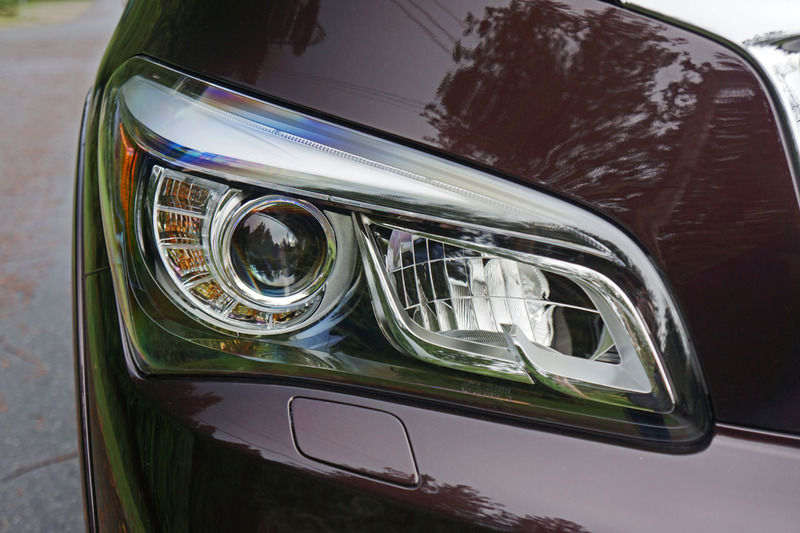 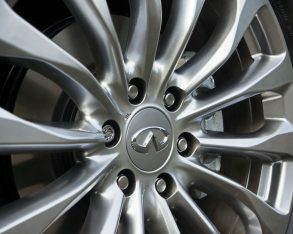 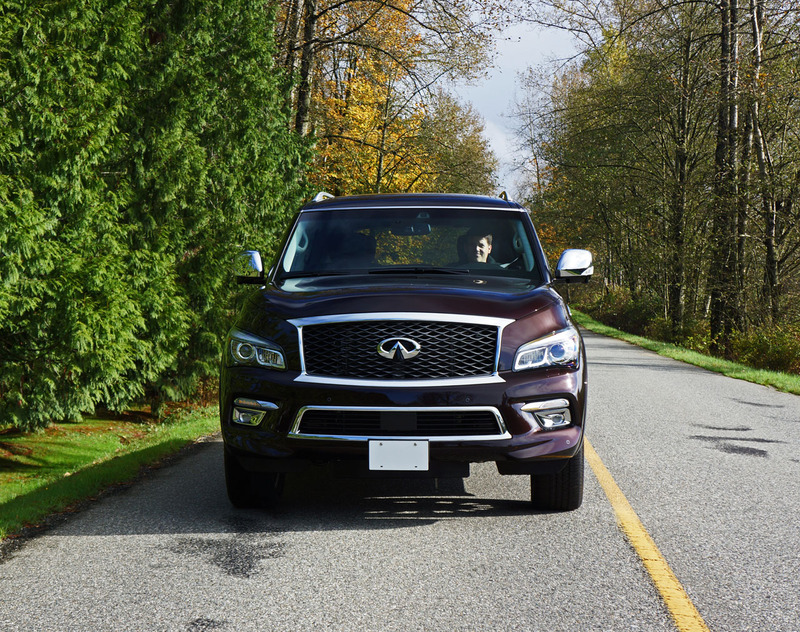 What wasn’t expected however was how well Infiniti’s largest manages corners, totally living up to the brand’s performance-oriented image as it stays loyally planted to the tarmac through fast-paced curves, begging to go faster and totally confidence inspiring throughout the process. 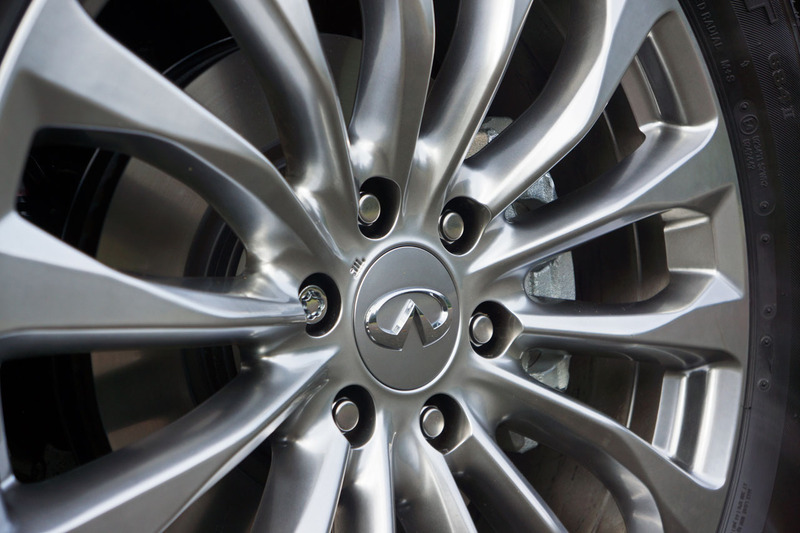 torque to each wheel as conditions require and sends up to 50 percent to those up front when needed. 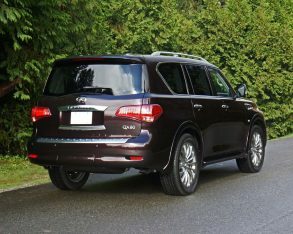 I’m guessing if fuel prices continue to remain low, large SUV sales will grow despite less than appealing fuel economy ratings. 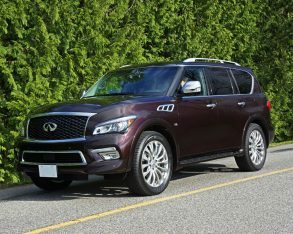 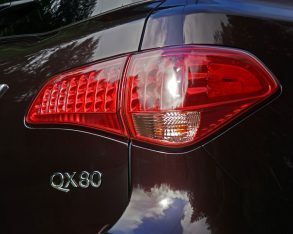 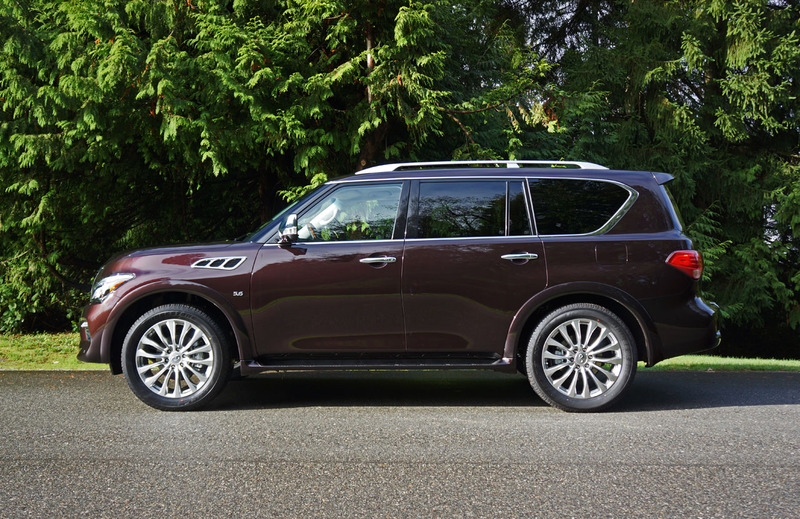 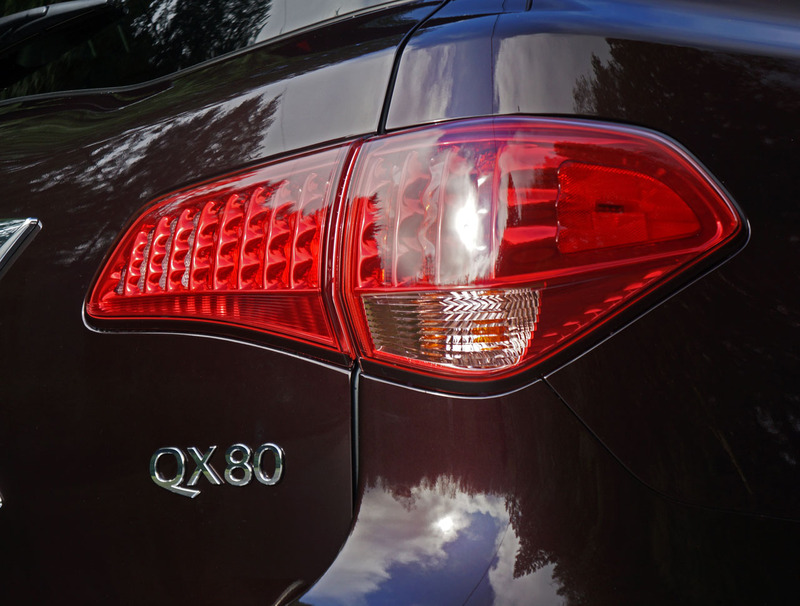 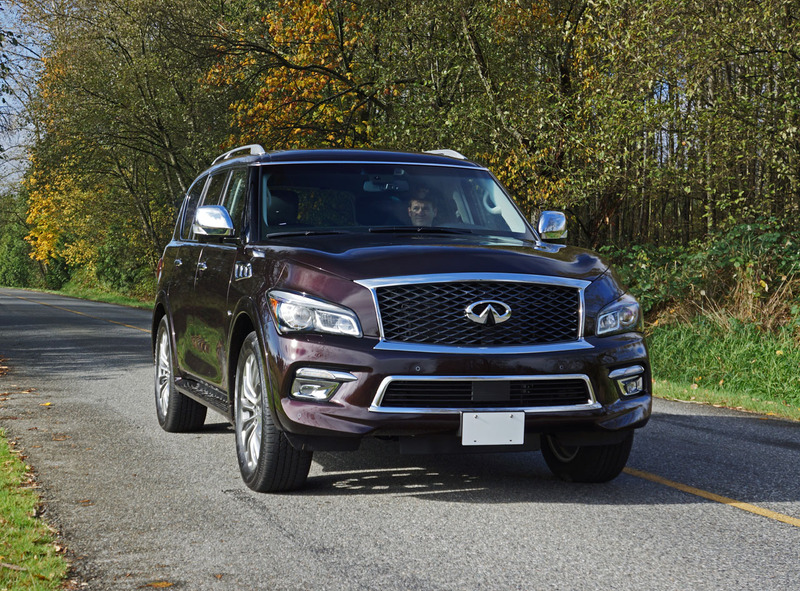 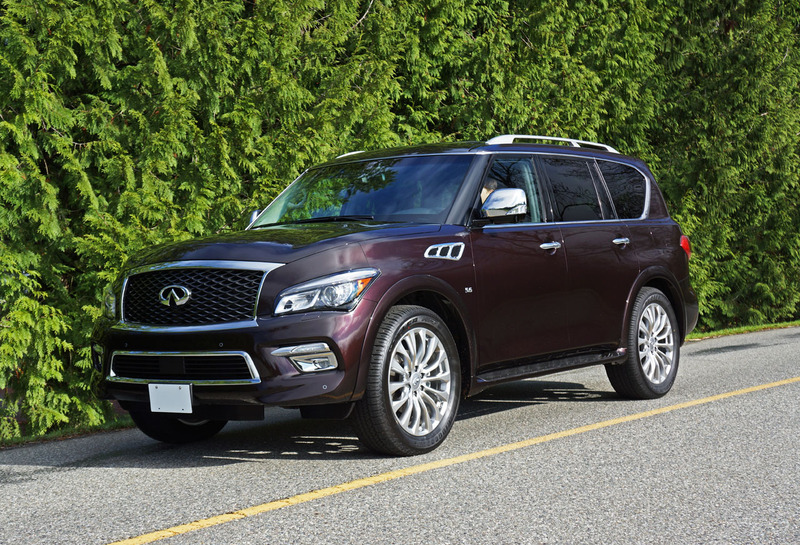 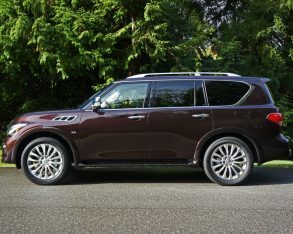 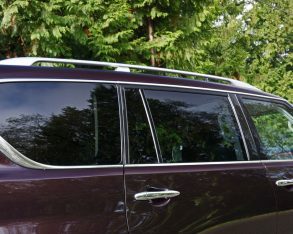 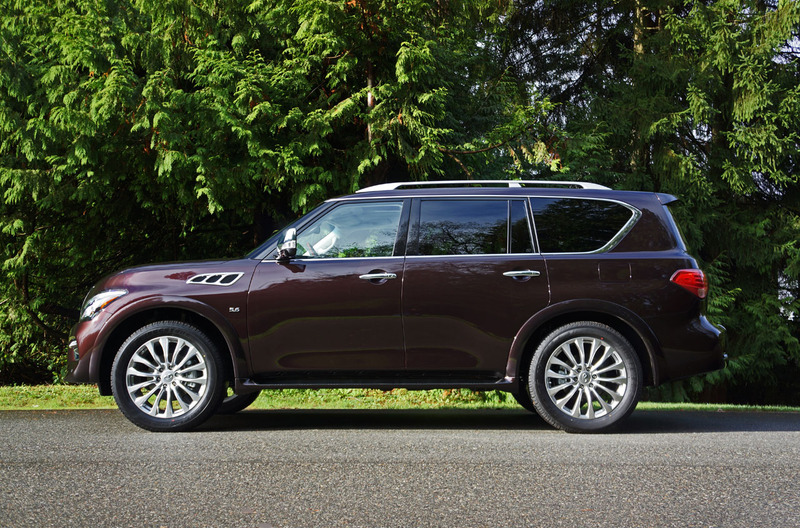 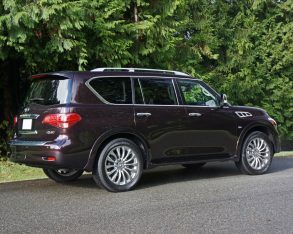 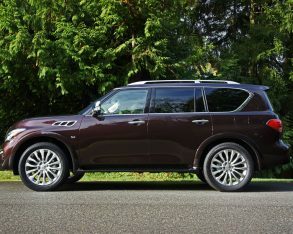 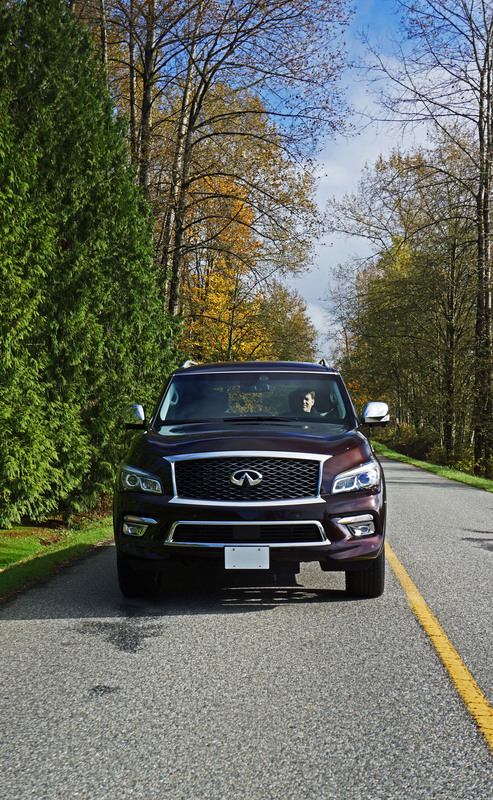 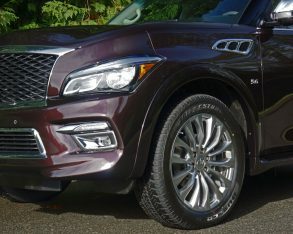 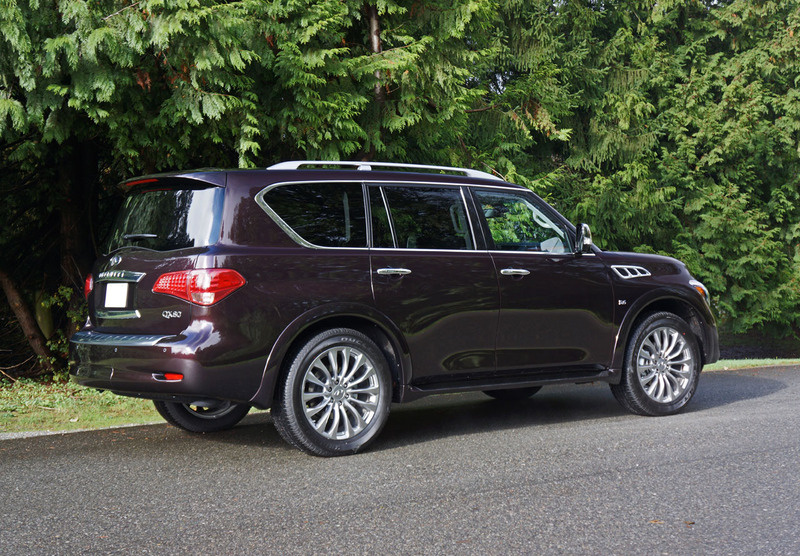 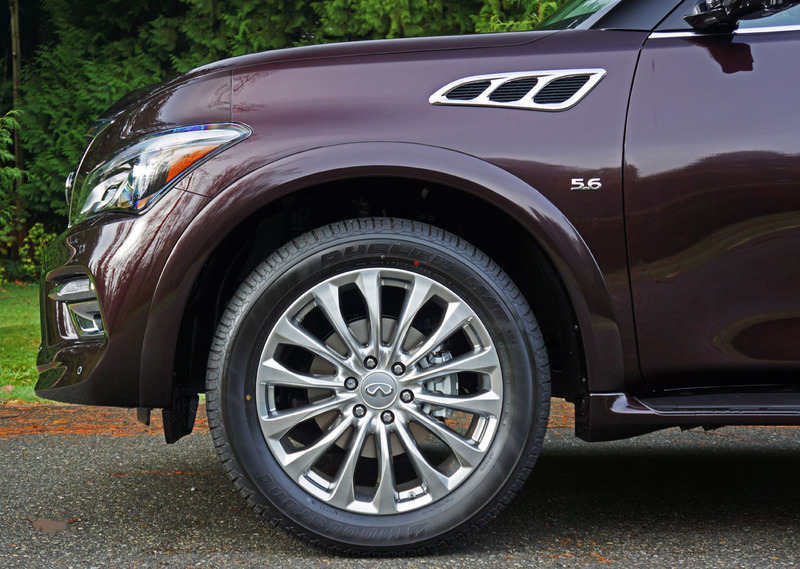 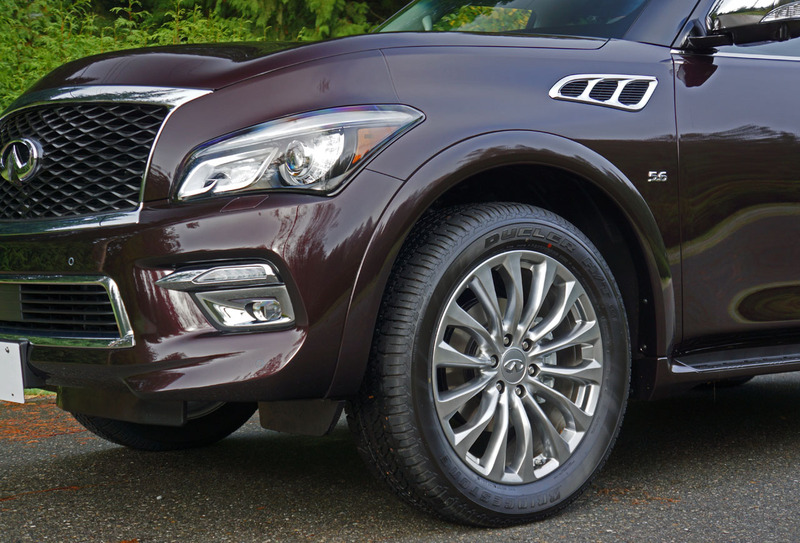 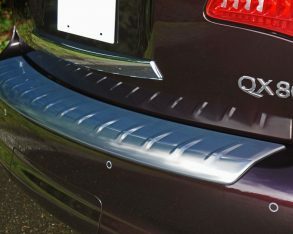 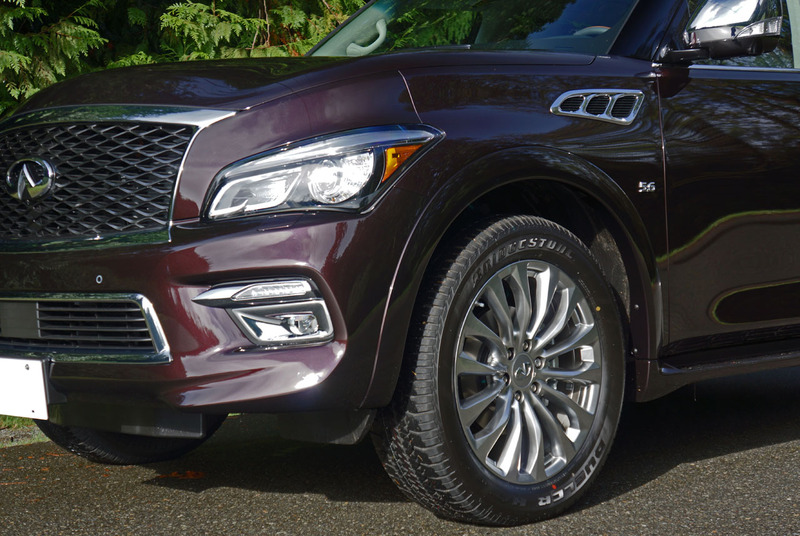 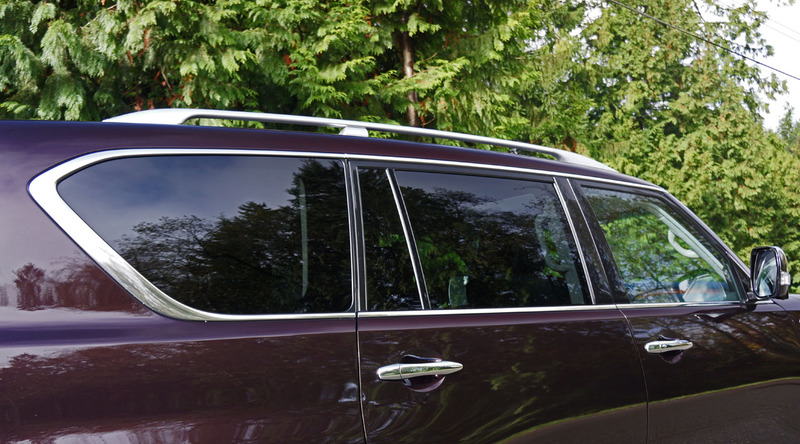 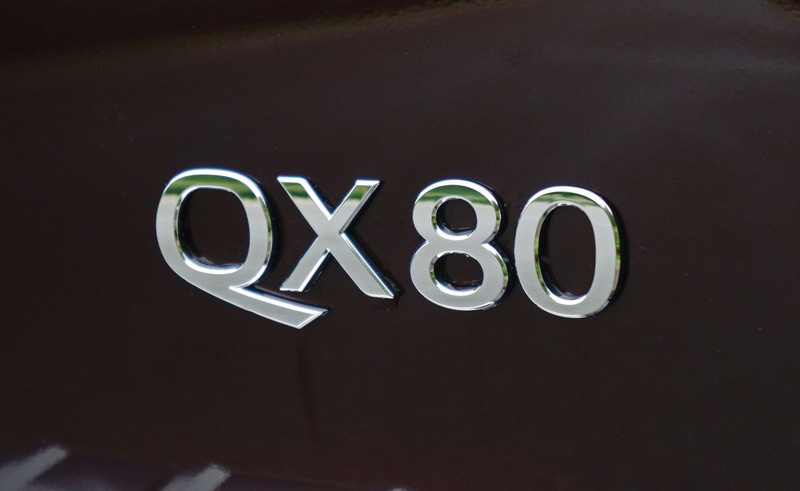 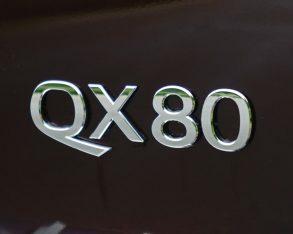 In this respect the QX80 is no worse than its full-size peers and better than some, receiving a National Resources Canada estimate of 16.9 L/100km in the city and 11.9 on the highway. 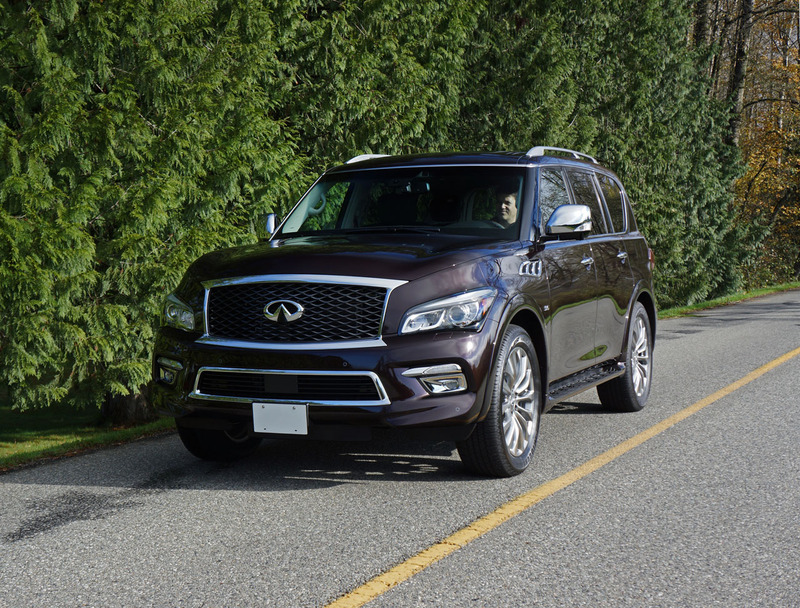 Noteworthy, these numbers reflect the new five-cycle testing protocol which is much more accurate than the previous two-cycle process, while even better news is the QX80’s requirement for only regular unleaded fuel, which saves about 10 percent when refilling its 98.4-litre tank. 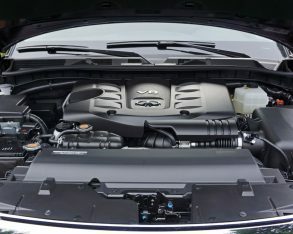 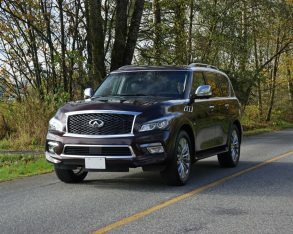 going to step out on a limb by assuming most full-size luxury SUV buyers aren’t as worried about fuel economy as the economy car set, which makes sense as purchasing a QX80 begins at $73,650 plus $1,995 for freight and pre-delivery prep (incidentally only $450 more than last year’s model despite its many upgrades). 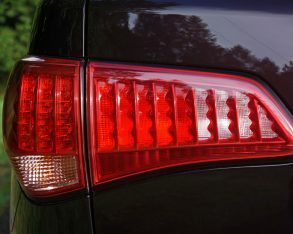 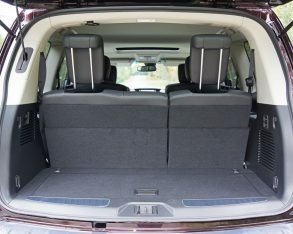 The price is the same whether going for a seven- or eight-occupant version, making it the full-size luxury SUV segment’s best deal by far. 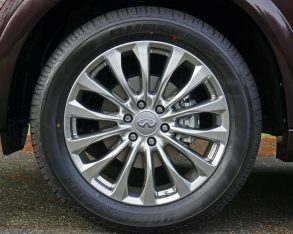 Spot Warning (BSW), Blind Spot Intervention (BSI), Lane Departure Warning (LDW), Lane Departure Prevention (LDP), Intelligent Brake Assist (IBA) with new Predictive Forward Collision Warning (PFCW), backup collision intervention (BCI), front seat pre-crash seatbelts, and the impressive set of 22-inch forged alloy wheels I mentioned earlier. 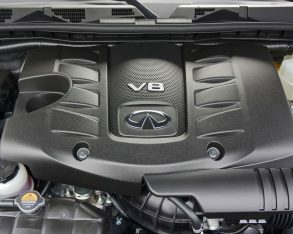 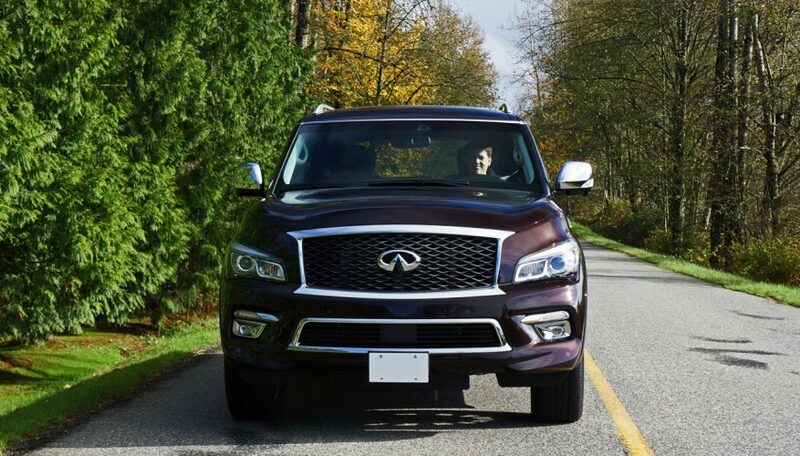 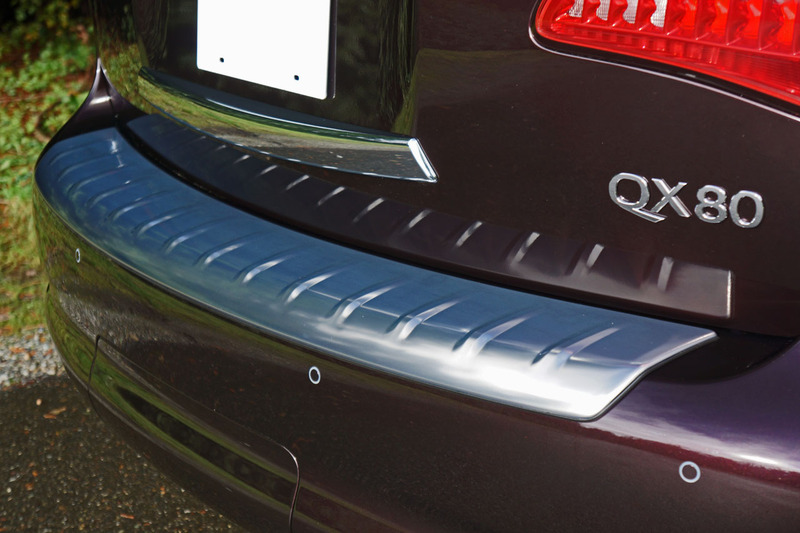 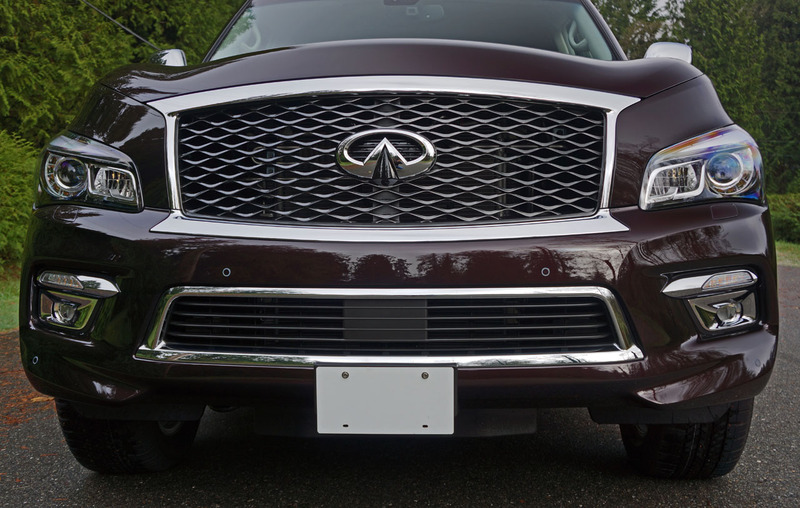 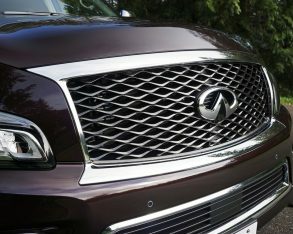 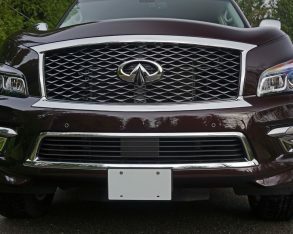 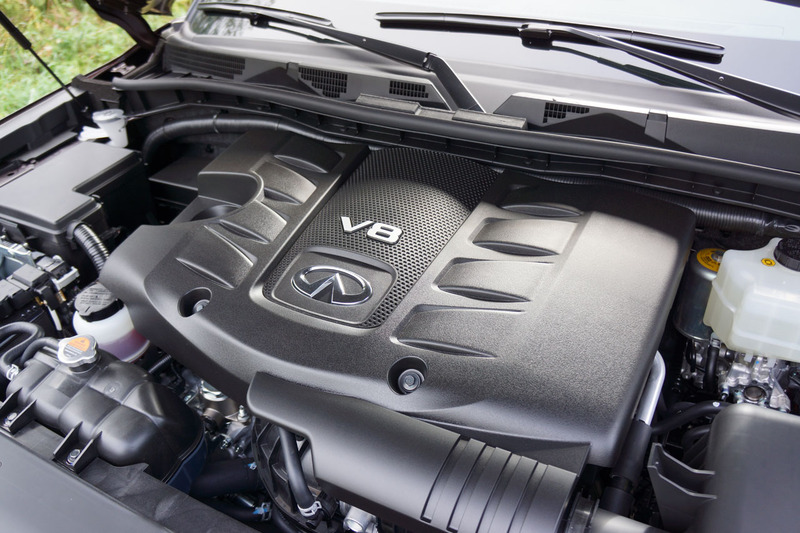 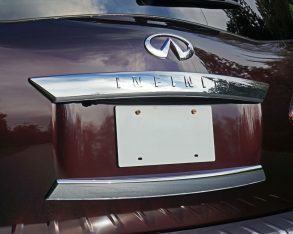 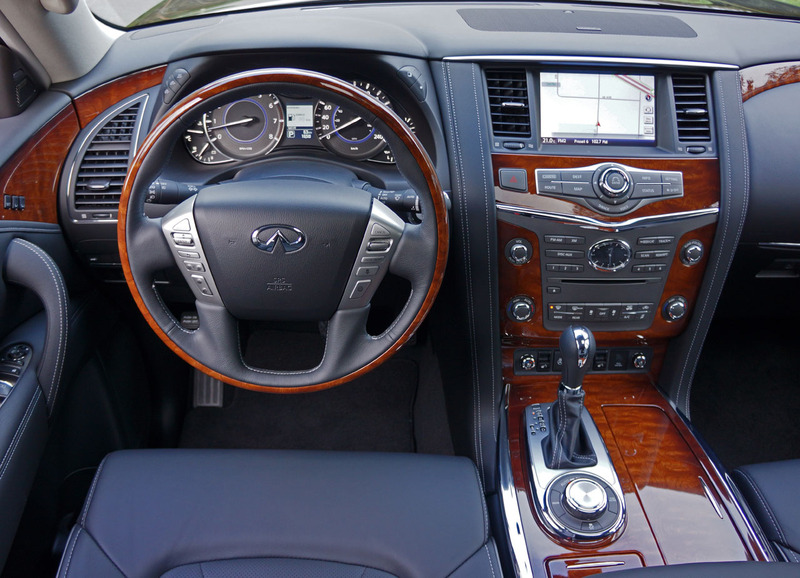 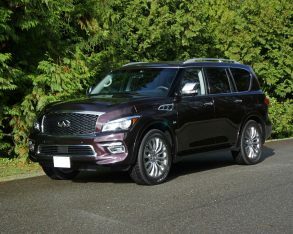 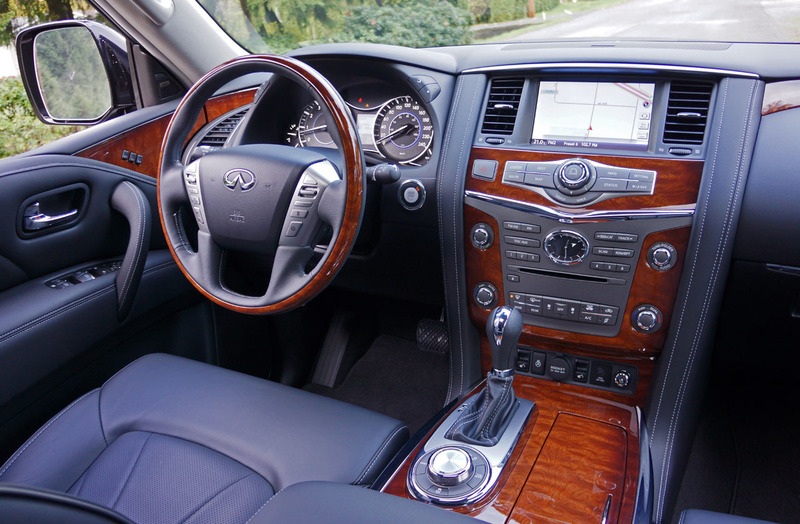 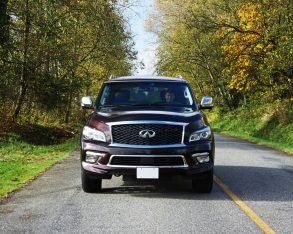 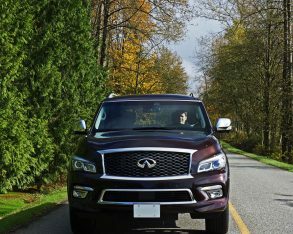 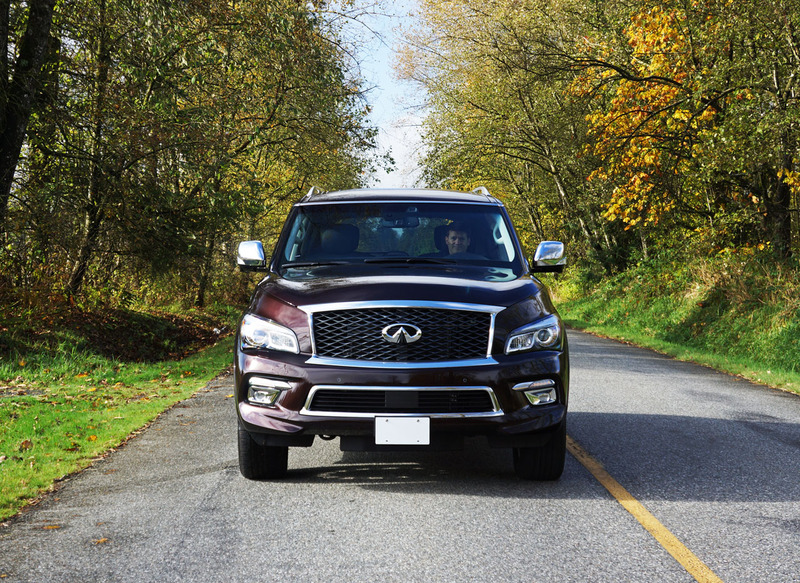 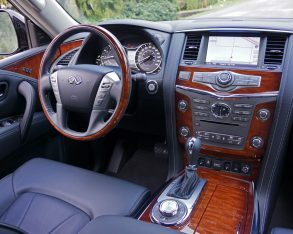 Even at $81,800 plus freight, the completely kitted out 2015 Infiniti QX80 Technology undercuts many of its full-size luxury rivals by tens of thousands, while boasting everything the majority of buyers in this class want, including high style and a prestigious nameplate. 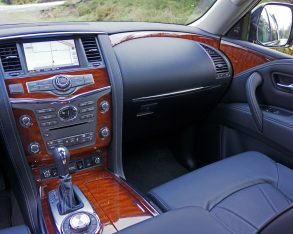 up in the upscale wood treatment too. 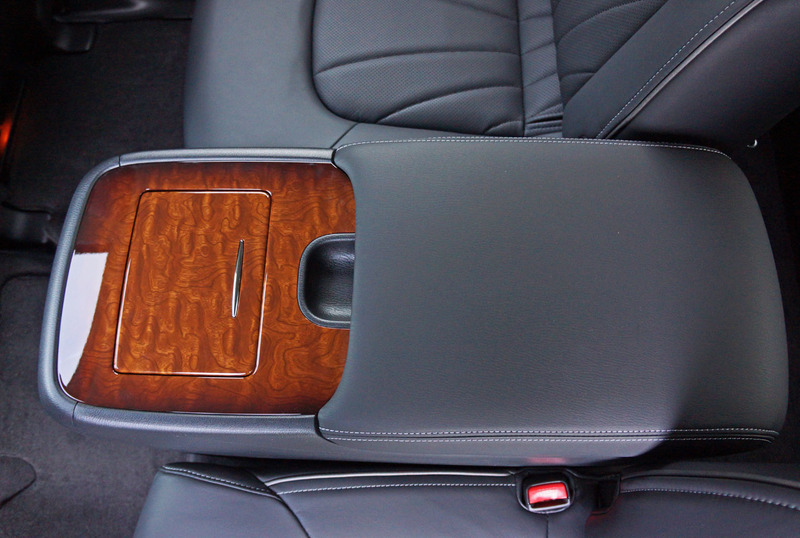 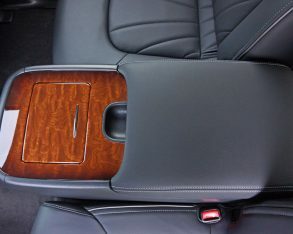 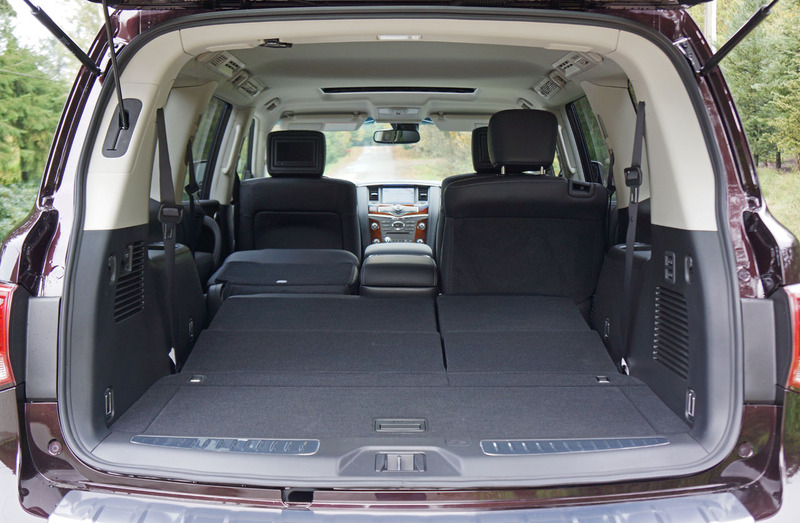 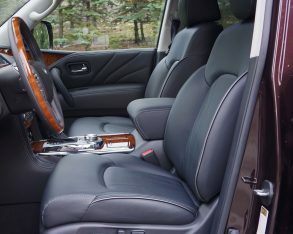 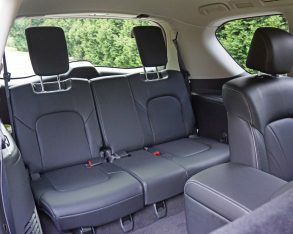 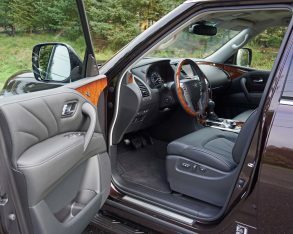 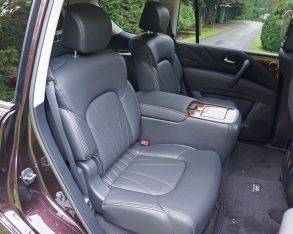 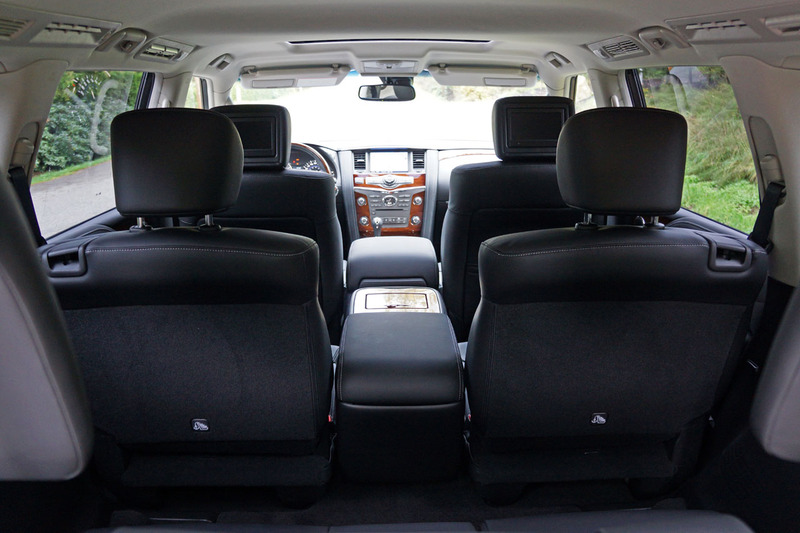 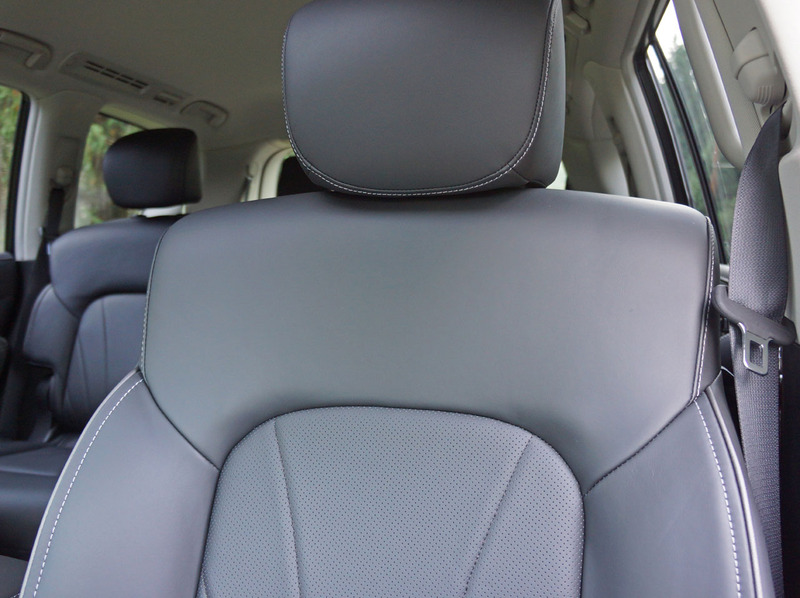 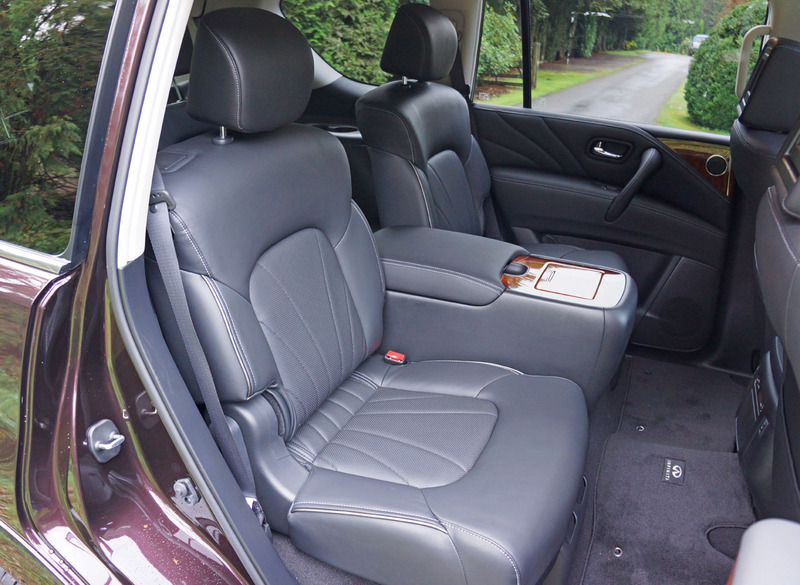 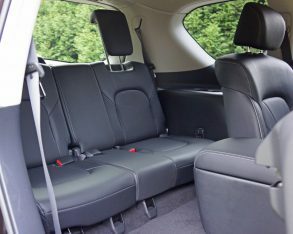 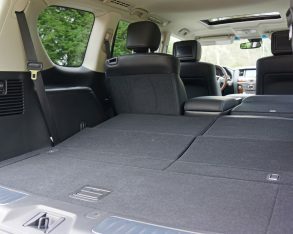 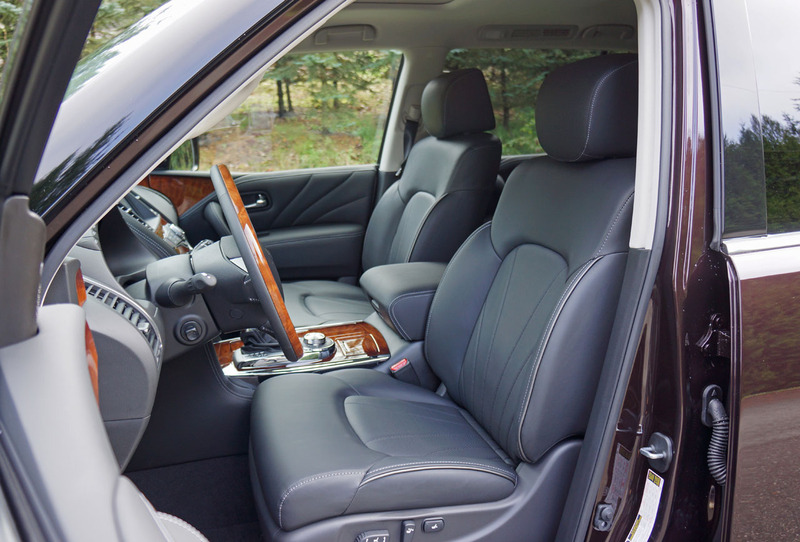 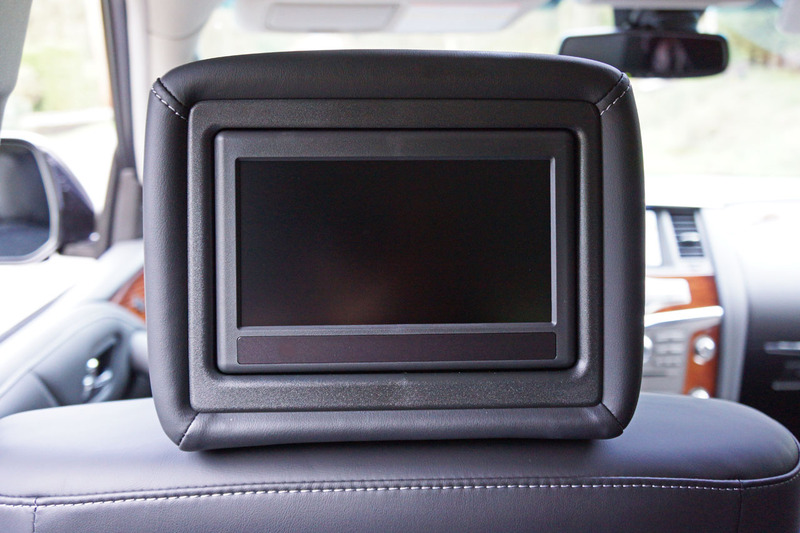 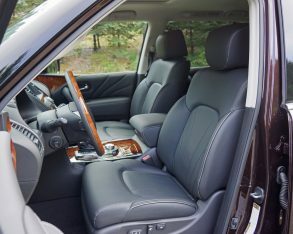 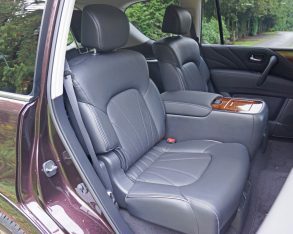 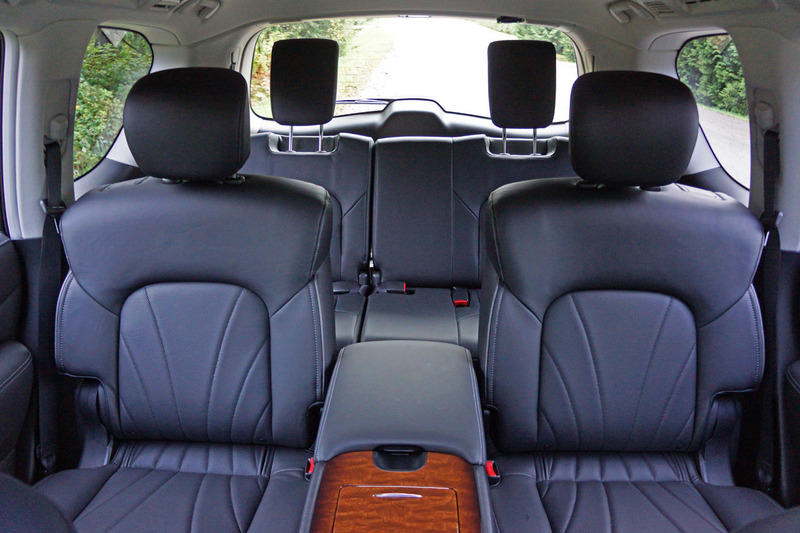 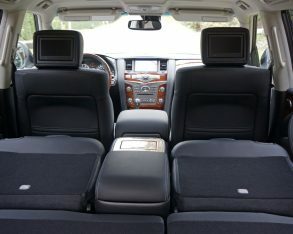 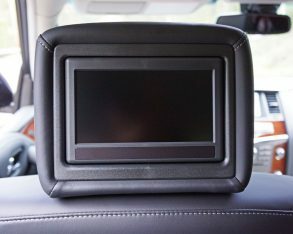 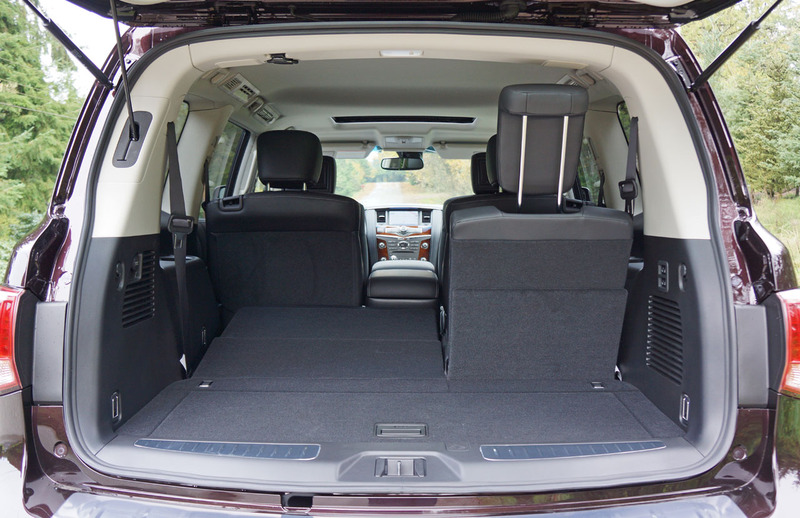 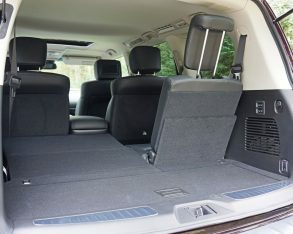 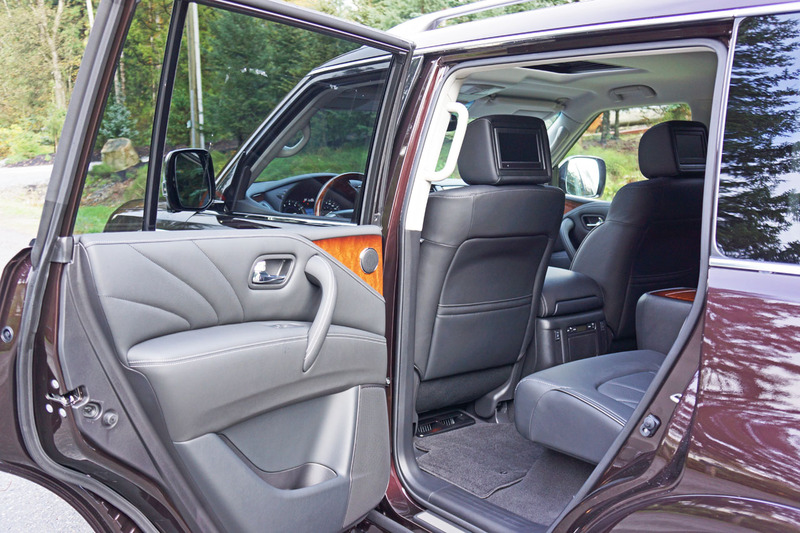 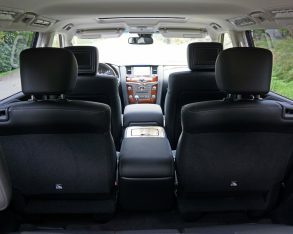 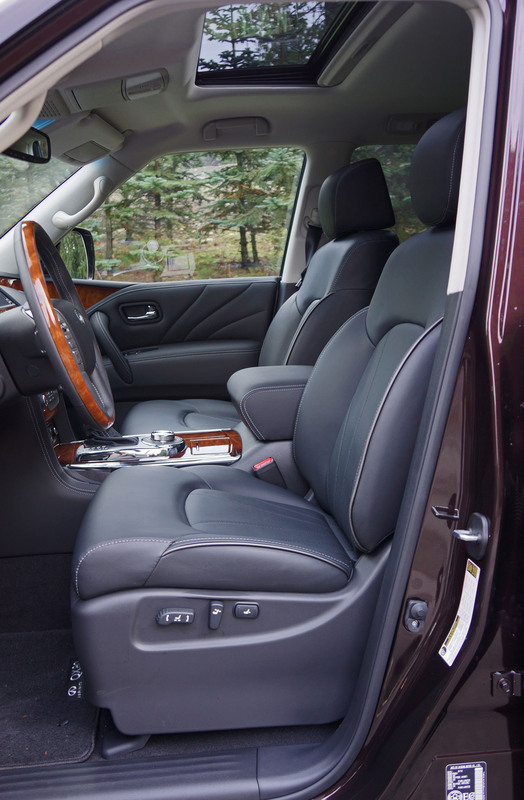 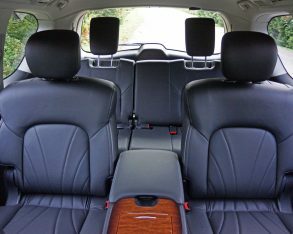 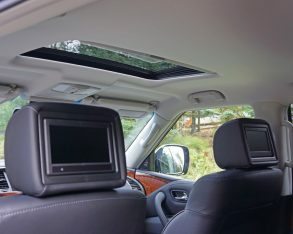 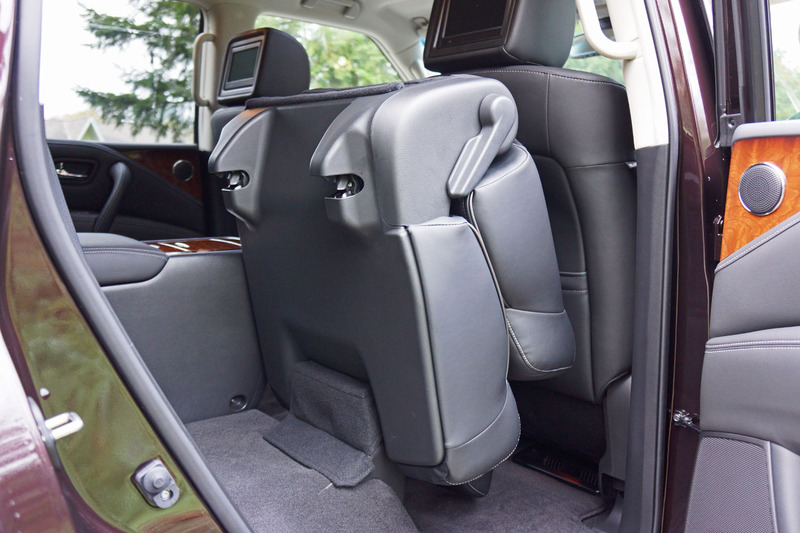 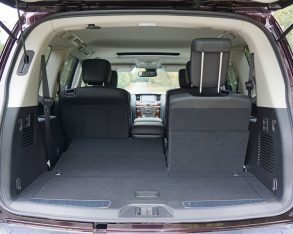 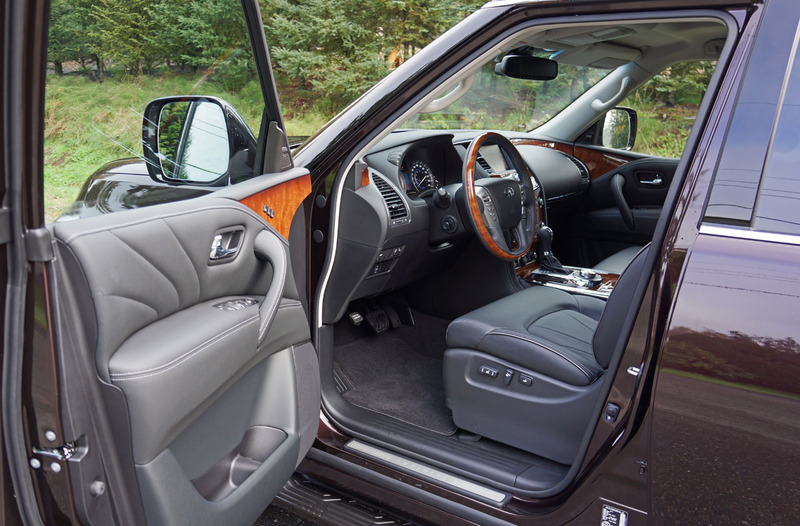 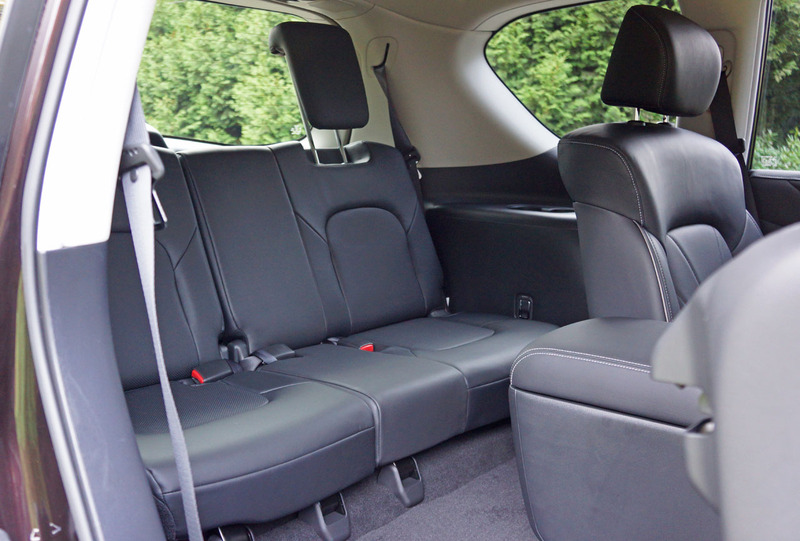 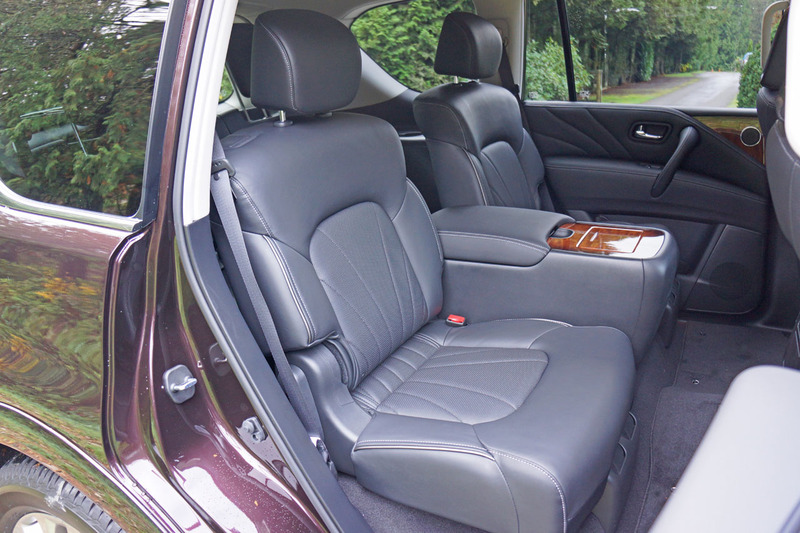 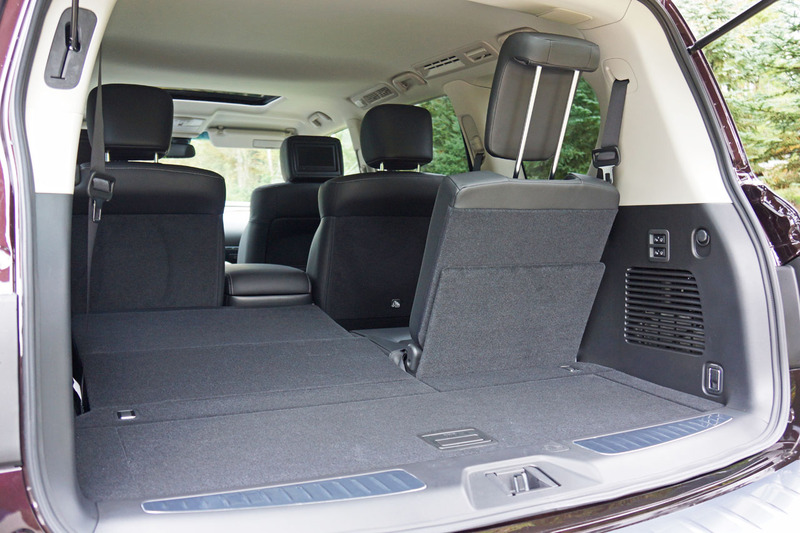 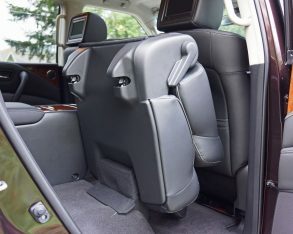 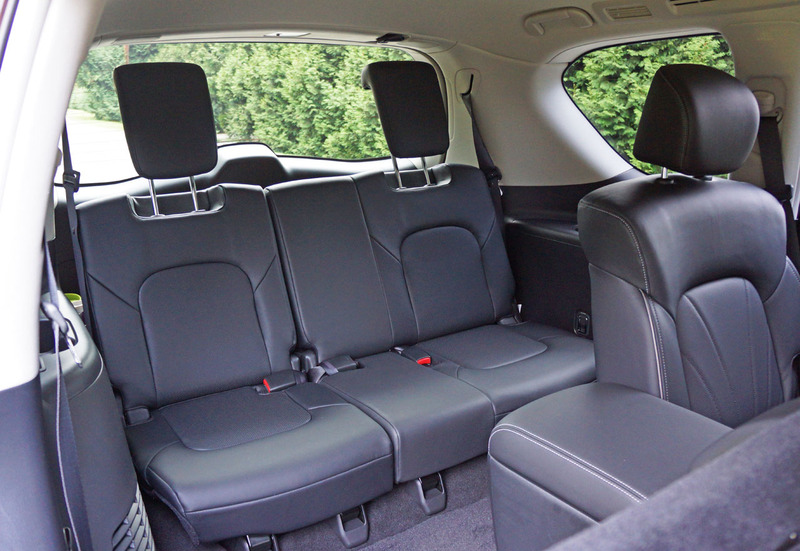 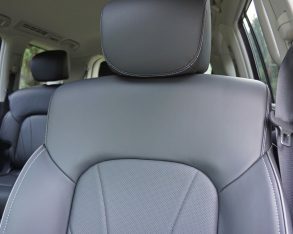 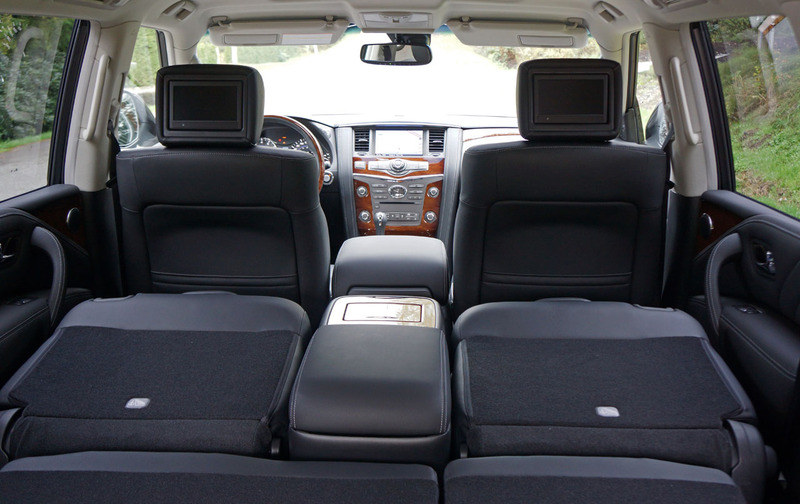 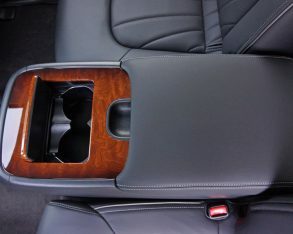 The seven-occupant model’s second-row passengers get standard heated captain’s chairs while eight-passenger QX80s incorporate a 60/40-split bench with heated cushions in the outboard positions. 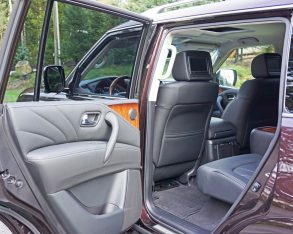 Access to the third row is ultra-easy via those automated forward flipping second-row seats I mentioned earlier, complete with front-seat controls, while those riding in back will want to be shorter in stature (kids being ideal) to maximize comfort; par for the course with most vehicles in this class. 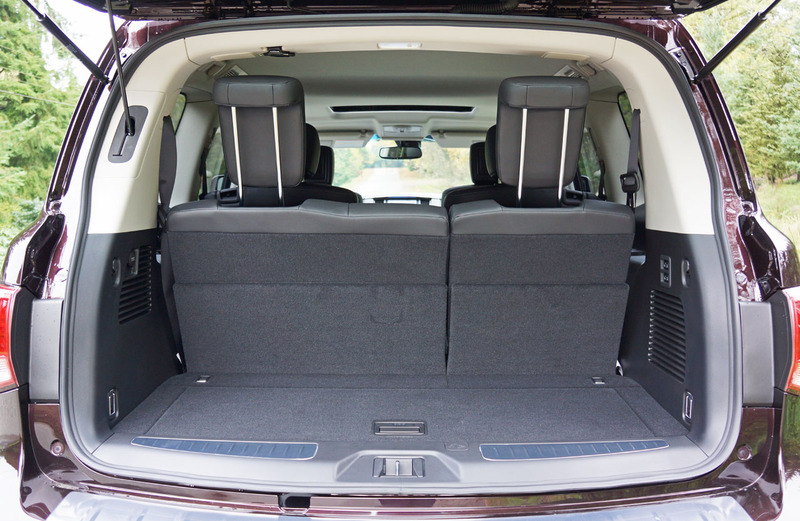 Open the powered rear liftgate and you’ll likely appreciate how easy it is to drop that third row into the cargo floor, a set of buttons allowing the power folding mechanism to increase cargo capacity from 470 litres to 1,405 behind the second row. 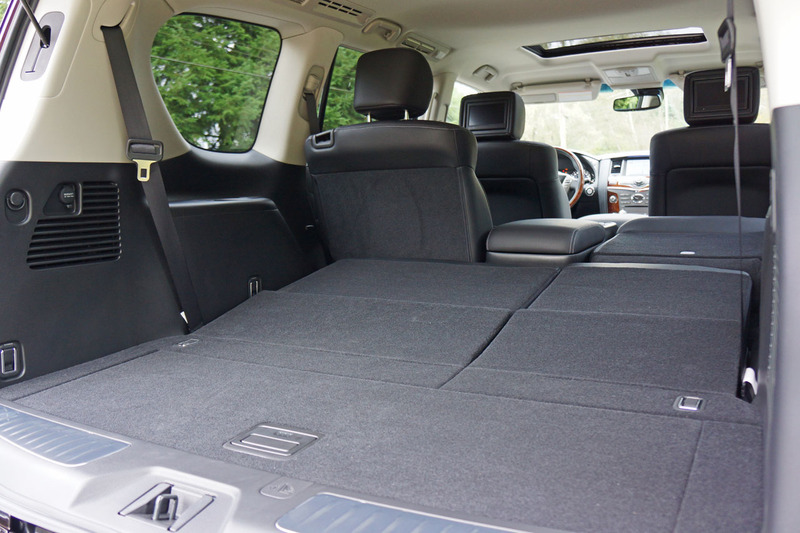 Lay the middle row flat and a total of 2,694 litres is at your disposal, ideal for weekend trips to the building supply store. 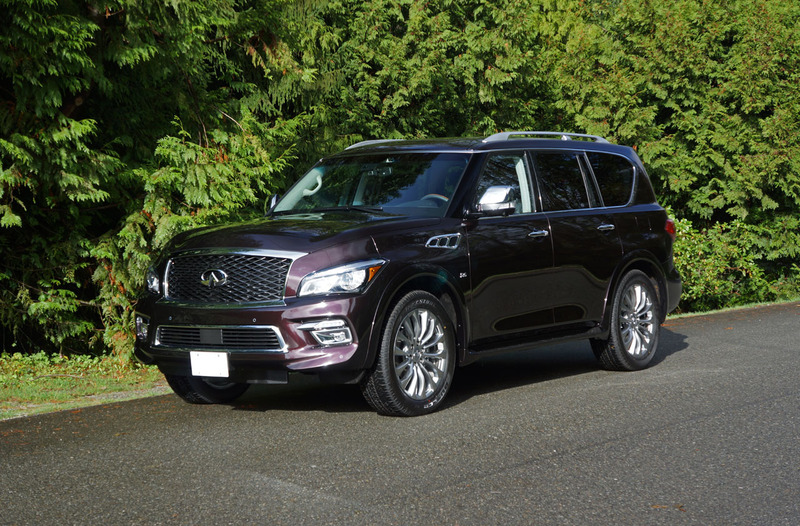 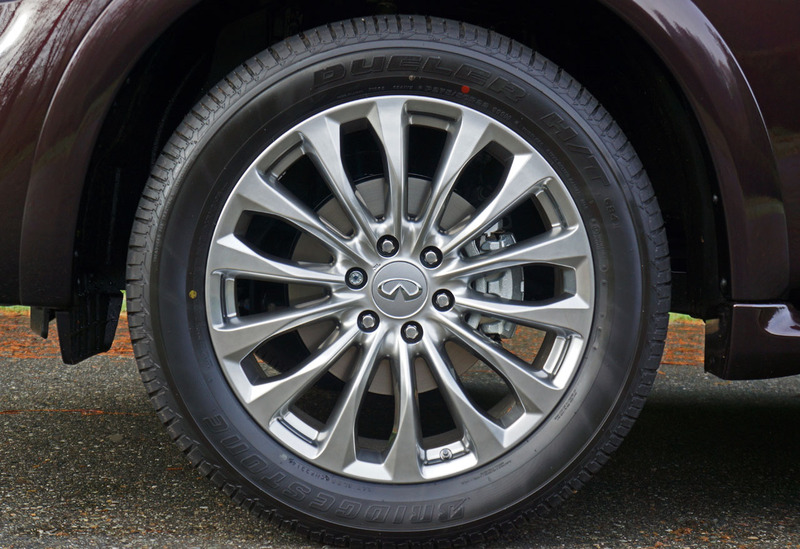 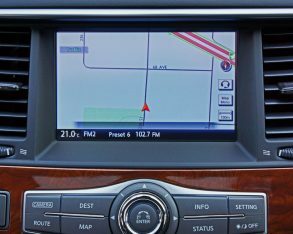 In summary, Infiniti’s 2015 QX80 continues to offer superb quality and refinement plus loads of useful features in a very well priced package. 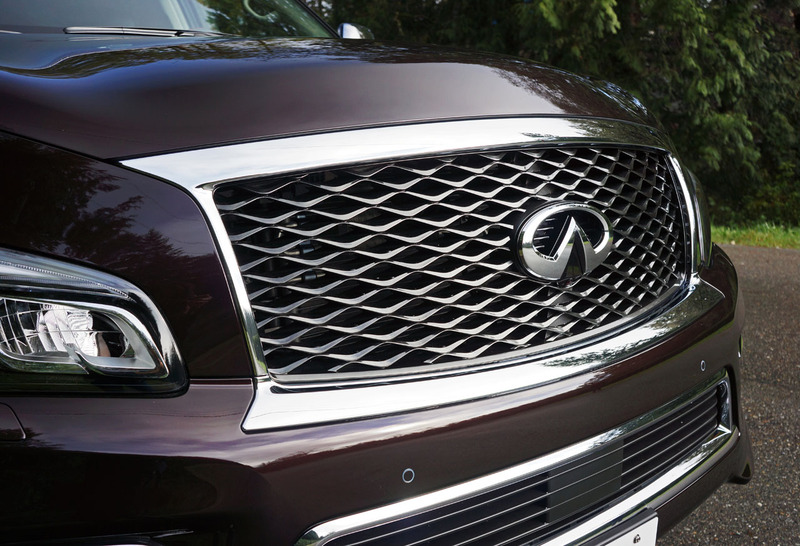 To pass by this impressive machine without giving it the respect it’s due would be a mistake.